Autochartist Market Reports are generated 3 times per day before the open of Tokyo, London and New York. These reports provide you with a snapshot of the technical outlook of the markets before the opening of the major financial centres. 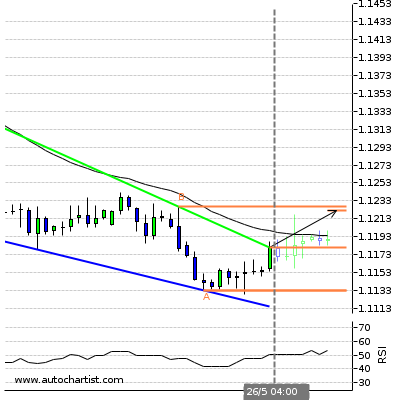 Possible bullish price movement towards the resistance 1.1318 within the next 4 hours. Triangle has broken through the support line at 26-Apr-03:00 2016 GMT. 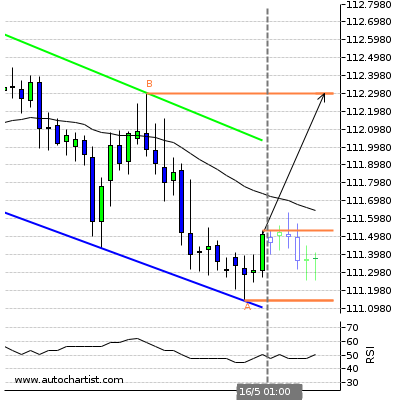 Possible bearish price movement forecast for the next 15 hours towards 110.458. ( A ) 111.2565Last resistance turning point of Triangle. 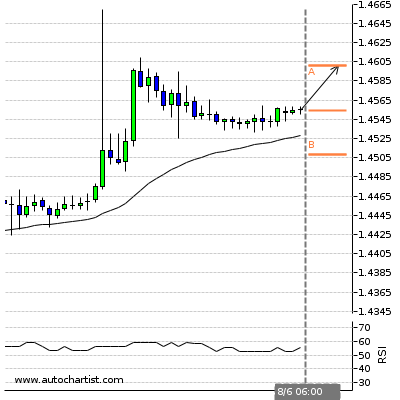 Possible bullish price movement towards the resistance 1.4617 within the next 4 hours. Possible bearish price movement towards the support 0.9717 within the next 4 hours. Triangle has broken through the support line at 26-Apr-08:00 2016 GMT. 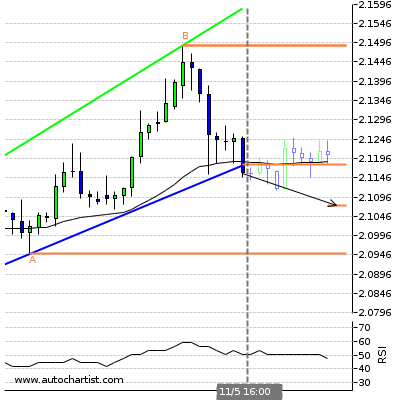 Possible bearish price movement forecast for the next 2 days towards 1.259. ( B ) 1.2686Last resistance turning point of Triangle. 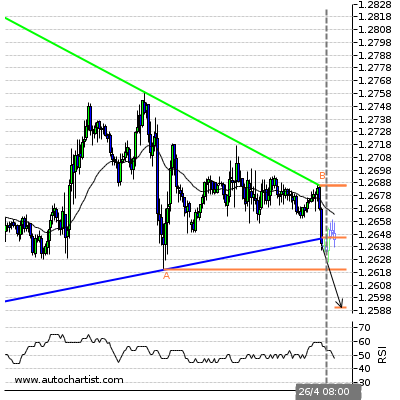 ( A ) 1.262Last support turning point of Triangle. Rising Wedge identified at 26-Apr-10:30 2016 GMT. This pattern is still in the process of forming. 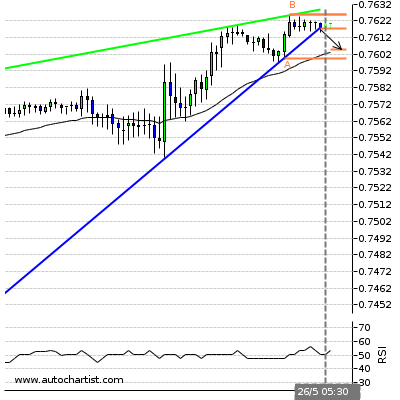 Possible bearish price movement towards the support 0.687 within the next 9 hours. ( B ) 0.6898Last resistance turning point of Rising Wedge. ( A ) 0.6866Last support turning point of Rising Wedge. Channel Up identified at 25-Apr-08:00 2016 GMT. This pattern is still in the process of forming. Possible bearish price movement towards the support 122.725 within the next 2 days. ( B ) 125.492Last resistance turning point of Channel Up. ( A ) 122.725Last support turning point of Channel Up. Triangle has broken through the support line at 26-Apr-08:00 2016 GMT. Possible bearish price movement forecast for the next 7 hours towards 1.424. 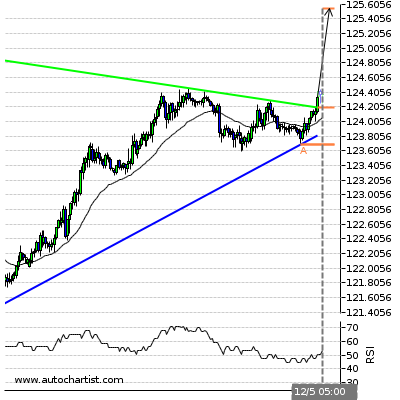 ( A ) 1.4294Last resistance turning point of Triangle. Descending Triangle identified at 26-Apr-09:30 2016 GMT. This pattern is still in the process of forming. Possible bearish price movement towards the support 1.635 within the next 8 hours. ( B ) 1.6401Last resistance turning point of Descending Triangle. ( A ) 1.6349Last support turning point of Descending Triangle. Rising Wedge has broken through the support line at 26-Apr-06:00 2016 GMT. 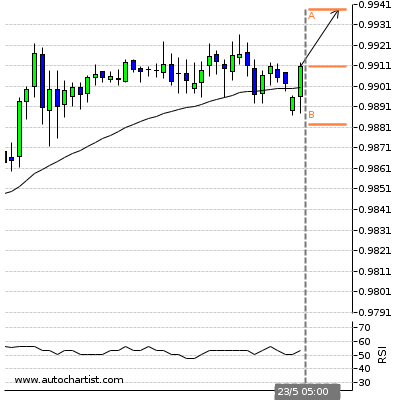 Possible bearish price movement forecast for the next 3 days towards 86.798. ( B ) 88.26Last resistance turning point of Rising Wedge. ( A ) 85.97Last support turning point of Rising Wedge. Rising Wedge has broken through the support line at 25-Apr-08:00 2016 GMT. 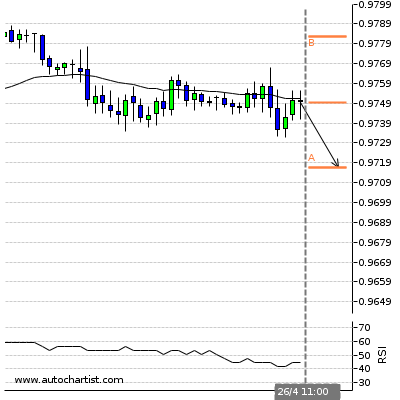 Possible bearish price movement forecast for the next 2 days towards 0.759. ( B ) 0.7738Last resistance turning point of Rising Wedge. ( A ) 0.765Last support turning point of Rising Wedge. Channel Up identified at 25-Apr-04:00 2016 GMT. This pattern is still in the process of forming. 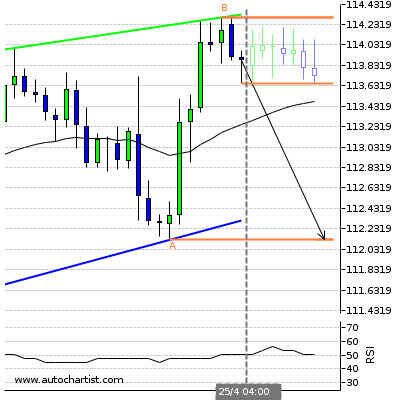 Possible bearish price movement towards the support 112.124 within the next 2 days. ( B ) 114.2965Last resistance turning point of Channel Up. ( A ) 112.124Last support turning point of Channel Up. Triangle identified at 26-Apr-09:00 2016 GMT. This pattern is still in the process of forming. 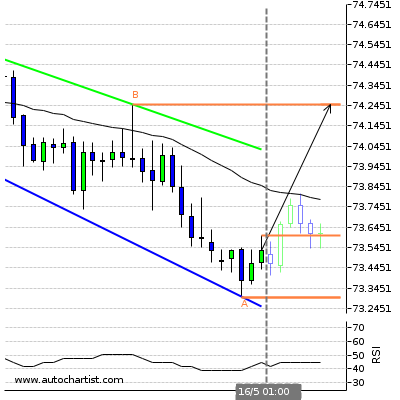 Possible bullish price movement towards the resistance 76.746 within the next 3 days. ( B ) 76.746Last resistance turning point of Triangle. ( A ) 76.0615Last support turning point of Triangle. Possible bearish price movement towards the support 108.5375 within the next 4 hours. Channel Up identified at 27-Apr-16:00 2016 GMT. This pattern is still in the process of forming. 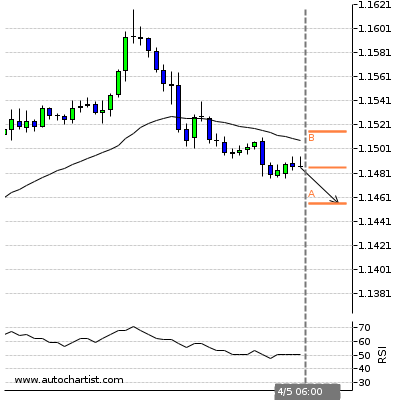 Possible bearish price movement towards the support 1.432 within the next 3 days. 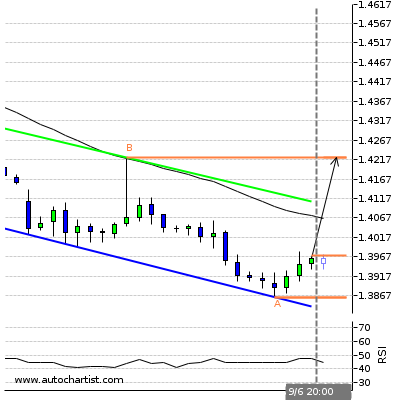 ( B ) 1.464Last resistance turning point of Channel Up. 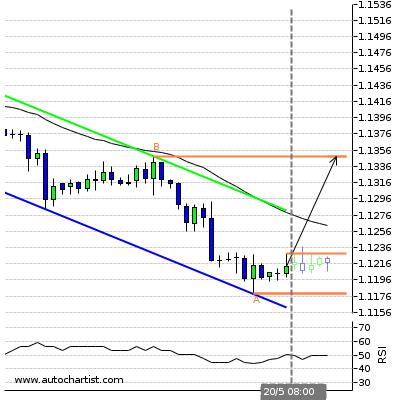 ( A ) 1.4322Last support turning point of Channel Up. 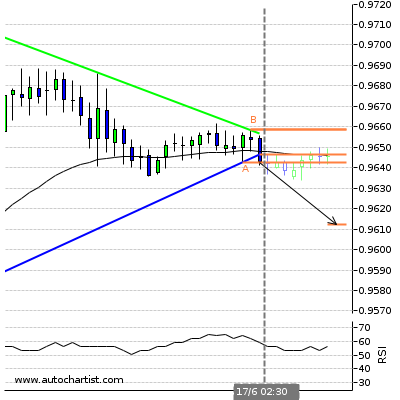 Possible bearish price movement towards the support 0.9663 within the next 4 hours. Descending Triangle identified at 28-Apr-03:00 2016 GMT. This pattern is still in the process of forming. 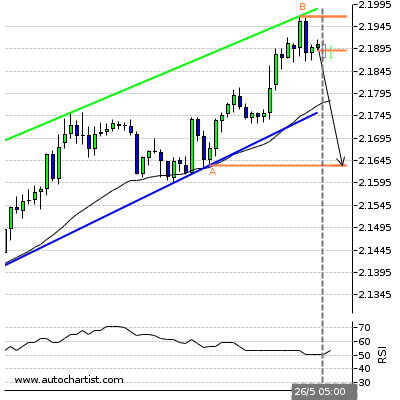 Possible bearish price movement towards the support 1.257 within the next 3 days. ( B ) 1.2695Last resistance turning point of Descending Triangle. 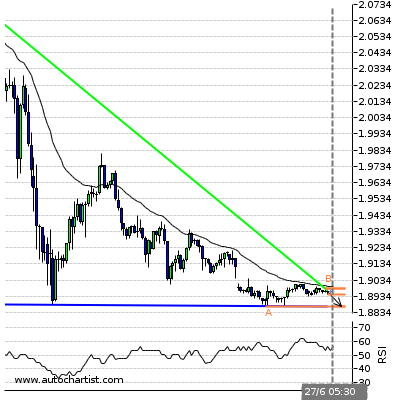 ( A ) 1.257Last support turning point of Descending Triangle. Falling Wedge has broken through the resistance line at 28-Apr-00:00 2016 GMT. 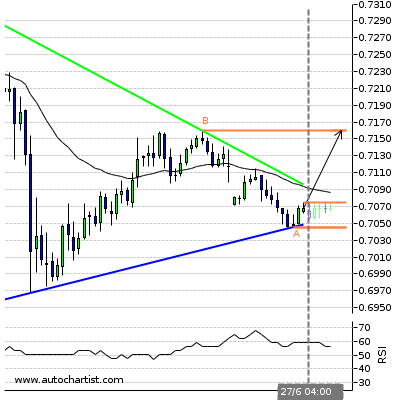 Possible bullish price movement forecast for the next 3 days towards 0.702. 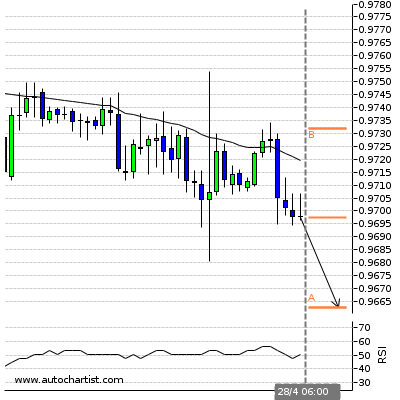 ( A ) 0.6807Last support turning point of Falling Wedge. Triangle identified at 28-Apr-04:00 2016 GMT. This pattern is still in the process of forming. Possible bullish price movement towards the resistance 1.101 within the next 2 days. ( B ) 1.1012Last resistance turning point of Triangle. 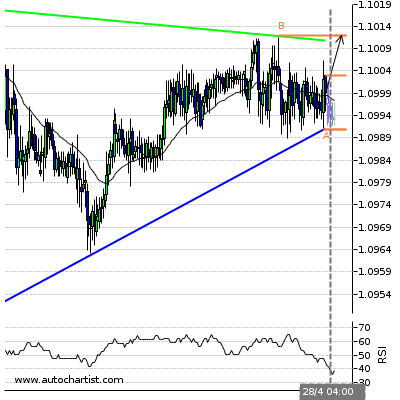 ( A ) 1.0991Last support turning point of Triangle. Ascending Triangle identified at 28-Apr-05:00 2016 GMT. This pattern is still in the process of forming. 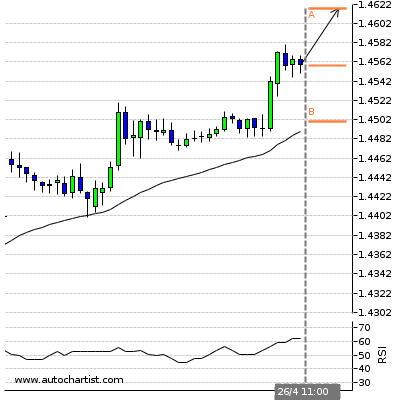 Possible bullish price movement towards the resistance 1.433 within the next 2 days. ( B ) 1.4333Last resistance turning point of Ascending Triangle. 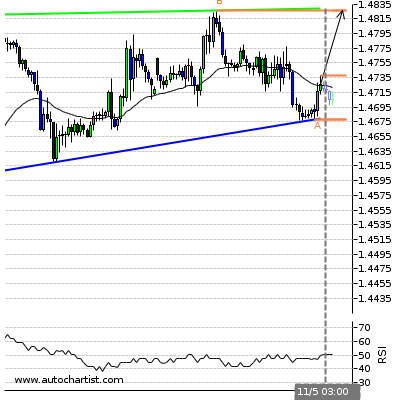 ( A ) 1.4225Last support turning point of Ascending Triangle. Channel Down identified at 28-Apr-04:00 2016 GMT. This pattern is still in the process of forming. Possible bullish price movement towards the resistance 1.844 within the next 12 hours. ( B ) 1.8436Last resistance turning point of Channel Down. ( A ) 1.8291Last support turning point of Channel Down. Channel Up has broken through the support line at 27-Apr-22:00 2016 GMT. 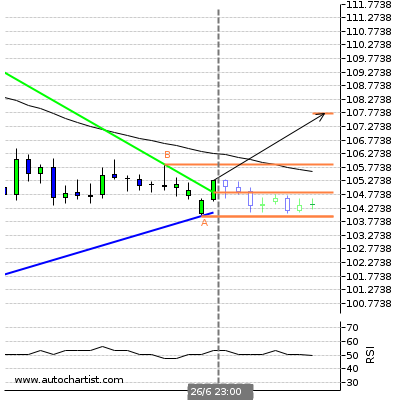 Possible bearish price movement forecast for the next 17 hours towards 2.094. ( A ) 2.1348Last resistance turning point of Channel Up. Rising Wedge has broken through the support line at 28-Apr-04:00 2016 GMT. 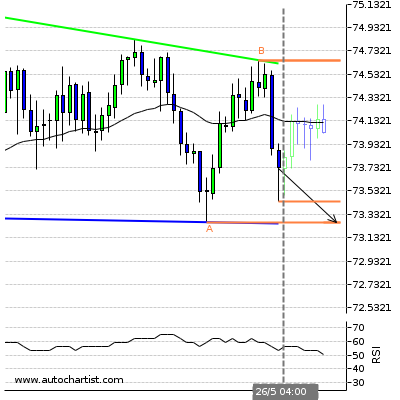 Possible bearish price movement forecast for the next 2 days towards 86.247. ( A ) 88.815Last resistance turning point of Rising Wedge. Ascending Triangle identified at 28-Apr-00:00 2016 GMT. This pattern is still in the process of forming. 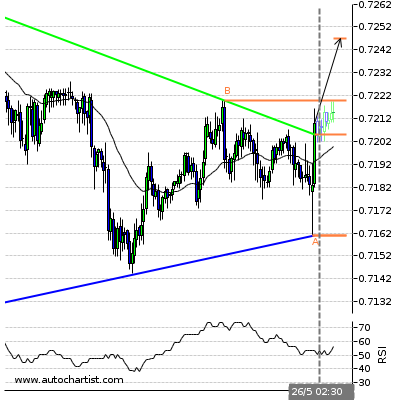 Possible bullish price movement towards the resistance 0.774 within the next 2 days. ( B ) 0.7741Last resistance turning point of Ascending Triangle. 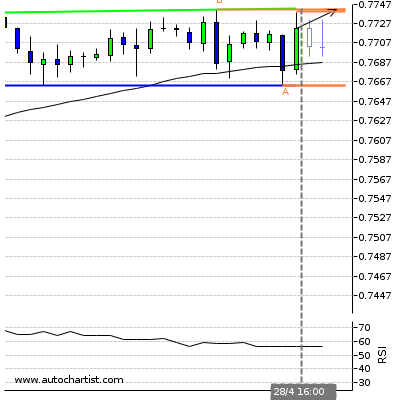 ( A ) 0.767Last support turning point of Ascending Triangle. Autochartist, MDIO Software, their members, shareholders, employees, agents, representatives and resellers do not warrant the completeness, accuracy or timeliness of the information supplied, and they shall not be liable for any loss or damage, consequential or otherwise, which may arise from the use or reliance on the service and its content. Possible bullish price movement towards the resistance 1.1421 within the next 4 hours. Descending Triangle has broken through the support line at 29-Apr-01:00 2016 GMT. 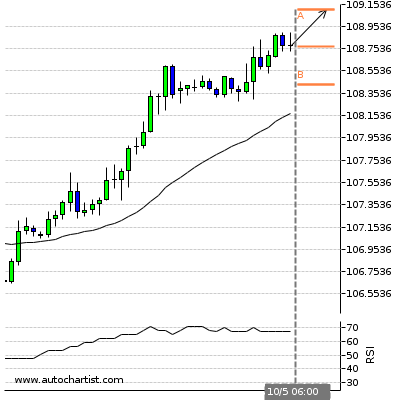 Possible bearish price movement forecast for the next 7 hours towards 106.738. ( A ) 108.125Last resistance turning point of Descending Triangle. Possible bullish price movement towards the resistance 1.4687 within the next 4 hours. 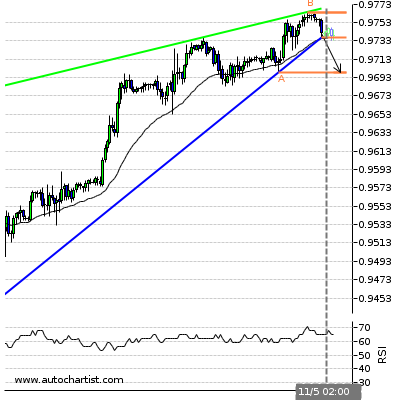 Possible bearish price movement towards the support 0.9602 within the next 4 hours. Triangle has broken through the support line at 29-Apr-01:00 2016 GMT. 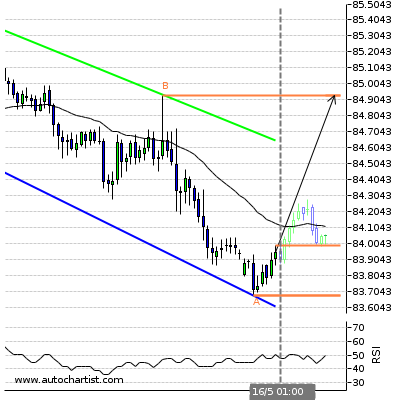 Possible bearish price movement forecast for the next 7 hours towards 156.365. ( A ) 158.006Last resistance turning point of Triangle. Descending Triangle has broken through the support line at 29-Apr-01:00 2016 GMT. 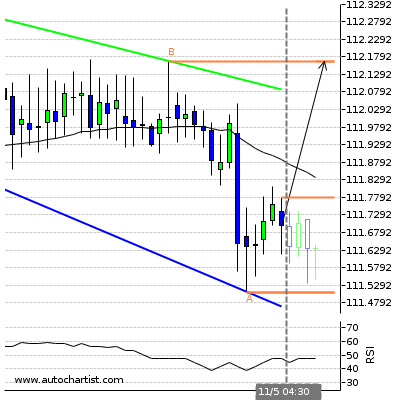 Possible bearish price movement forecast for the next 7 hours towards 121.757. ( A ) 122.8Last resistance turning point of Descending Triangle. Head and Shoulders identified at 28-Apr-22:00 2016 GMT. This pattern is still in the process of forming. 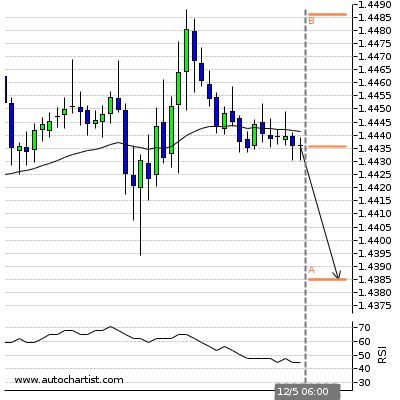 Possible bearish price movement towards the support 1.405 within the next 2 days. 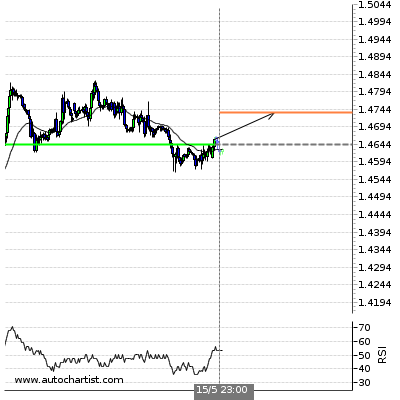 ( B ) 1.415Last resistance turning point of Head and Shoulders. 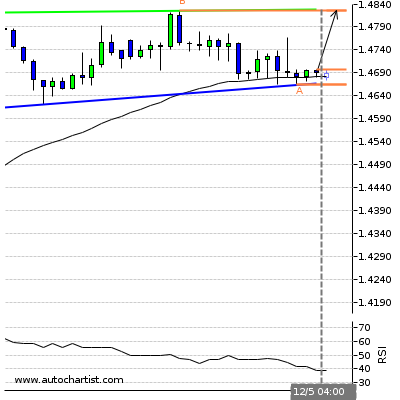 ( A ) 1.4054Last support turning point of Head and Shoulders. Triangle has broken through the resistance line at 29-Apr-03:00 2016 GMT. 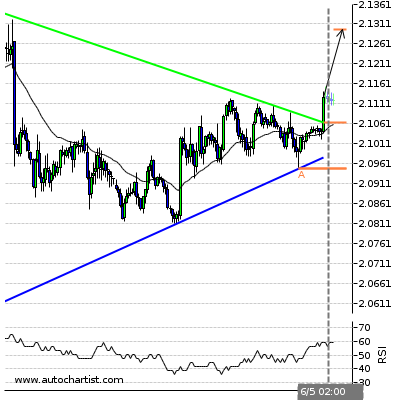 Possible bullish price movement forecast for the next 9 hours towards 2.113. ( B ) 2.1017Last resistance turning point of Triangle. ( A ) 2.094Last support turning point of Triangle. Flag identified at 28-Apr-16:00 2016 GMT. This pattern is still in the process of forming. 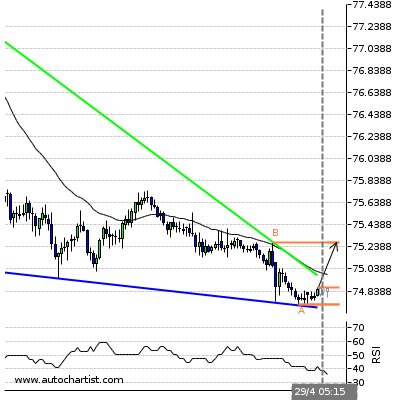 Possible bullish price movement towards the resistance 0.774 within the next 2 days. ( B ) 0.7741Last resistance turning point of Flag. 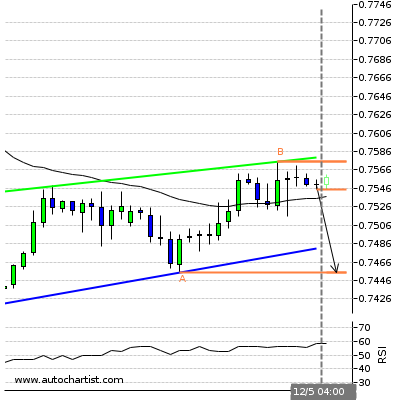 ( A ) 0.7663Last support turning point of Flag. Falling Wedge identified at 29-Apr-05:15 2016 GMT. This pattern is still in the process of forming. 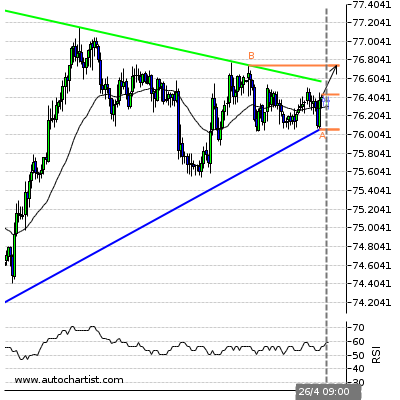 Possible bullish price movement towards the resistance 75.279 within the next 8 hours. 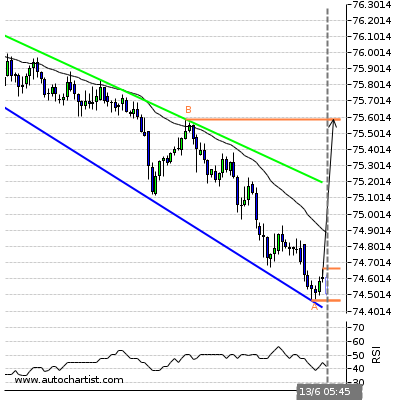 ( B ) 75.279Last resistance turning point of Falling Wedge. ( A ) 74.7135Last support turning point of Falling Wedge. Channel Up identified at 29-Apr-04:30 2016 GMT. This pattern is still in the process of forming. 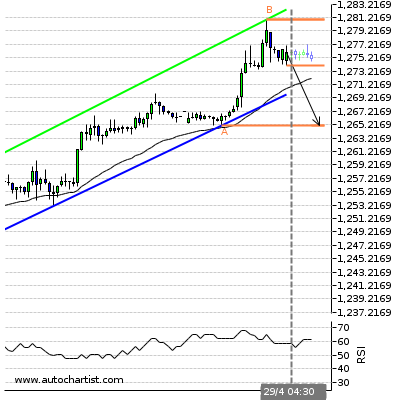 Possible bearish price movement towards the support 1,265.1 within the next 6 hours. ( B ) 1280.92Last resistance turning point of Channel Up. 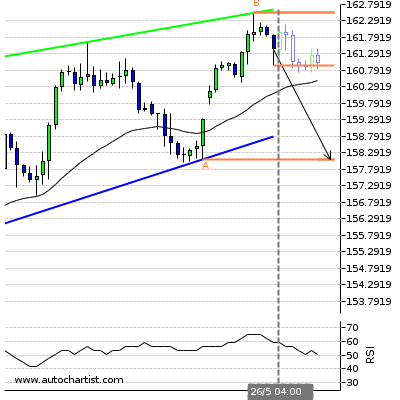 ( A ) 1265.1Last support turning point of Channel Up. Possible bullish price movement towards the resistance 1.149 within the next 4 hours. Possible bearish price movement towards the support 106.2455 within the next 4 hours. Rising Wedge identified at 29-Apr-20:00 2016 GMT. This pattern is still in the process of forming. 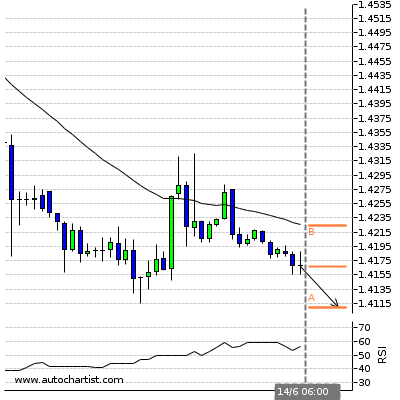 Possible bearish price movement towards the support 1.447 within the next 2 days. ( B ) 1.4671Last resistance turning point of Rising Wedge. 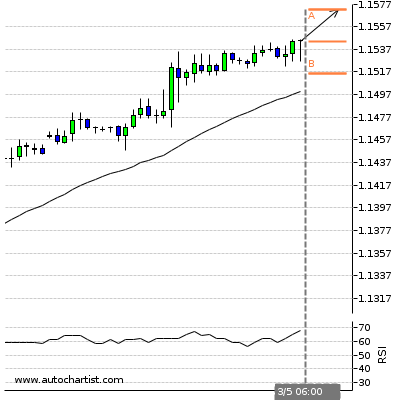 ( A ) 1.4474Last support turning point of Rising Wedge. Triangle identified at 01-May-22:00 2016 GMT. This pattern is still in the process of forming. 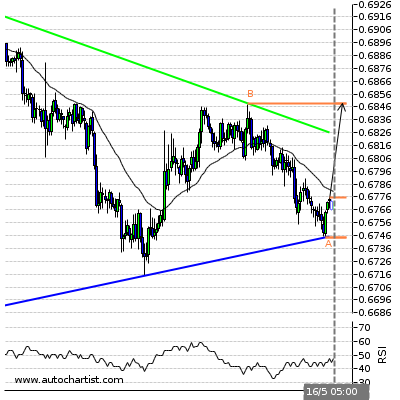 Possible bullish price movement towards the resistance 0.767 within the next 22 hours. 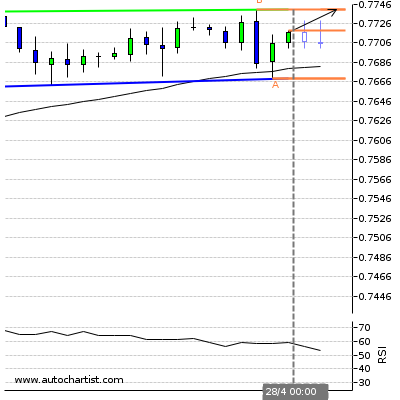 ( B ) 0.767Last resistance turning point of Triangle. ( A ) 0.7587Last support turning point of Triangle. 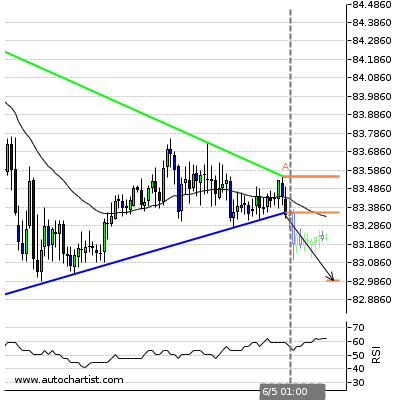 Possible bearish price movement towards the support 0.9564 within the next 4 hours. Falling Wedge has broken through the resistance line at 02-May-01:30 2016 GMT. 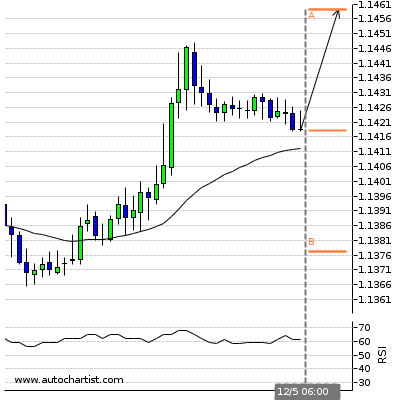 Possible bullish price movement forecast for the next 14 hours towards 156.821. ( B ) 157.3055Last resistance turning point of Falling Wedge. 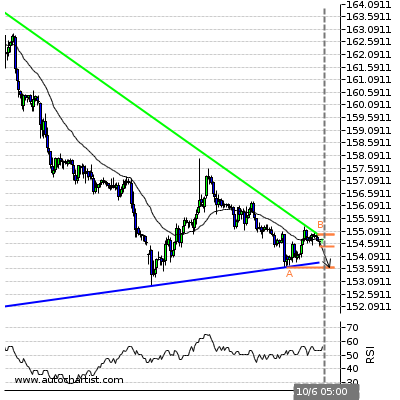 ( A ) 154.925Last support turning point of Falling Wedge. Descending Triangle identified at 02-May-06:30 2016 GMT. This pattern is still in the process of forming. 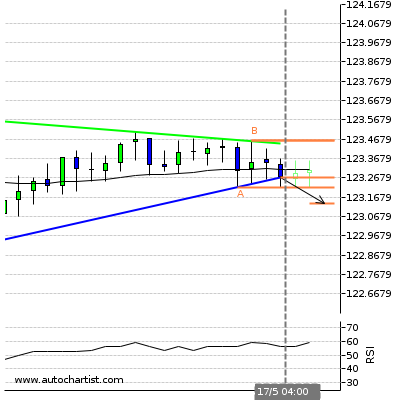 Possible bearish price movement towards the support 121.674 within the next 6 hours. ( B ) 122.265Last resistance turning point of Descending Triangle. ( A ) 121.6745Last support turning point of Descending Triangle. Channel Down identified at 29-Apr-20:00 2016 GMT. This pattern is still in the process of forming. Possible bullish price movement towards the resistance 1.101 within the next 2 days. ( B ) 1.1012Last resistance turning point of Channel Down. 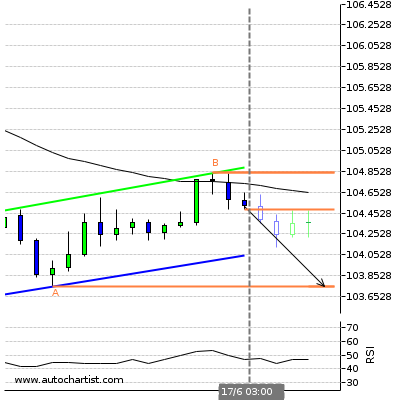 ( A ) 1.0954Last support turning point of Channel Down. Channel Down identified at 02-May-02:00 2016 GMT. This pattern is still in the process of forming. 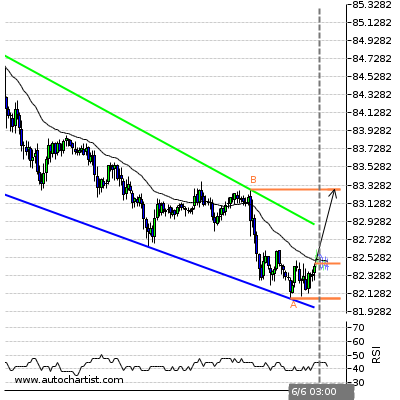 Possible bullish price movement towards the resistance 1.414 within the next 20 hours. 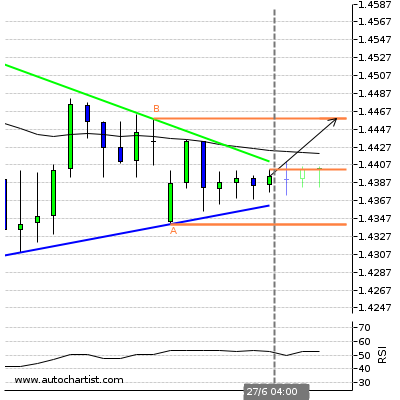 ( B ) 1.4135Last resistance turning point of Channel Down. 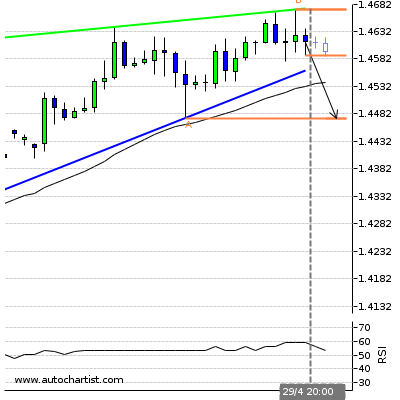 ( A ) 1.3974Last support turning point of Channel Down. Possible bullish price movement towards the resistance 1.1573 within the next 4 hours. 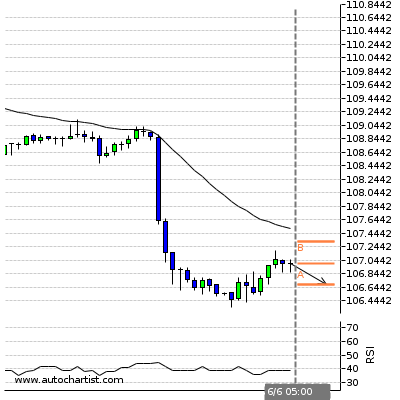 Possible bearish price movement towards the support 105.5494 within the next 4 hours. Rising Wedge identified at 03-May-00:00 2016 GMT. This pattern is still in the process of forming. 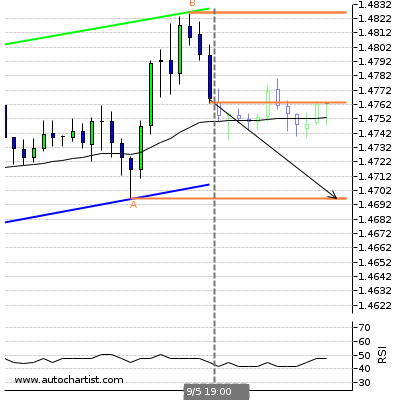 Possible bearish price movement towards the support 1.461 within the next 2 days. ( B ) 1.4698Last resistance turning point of Rising Wedge. 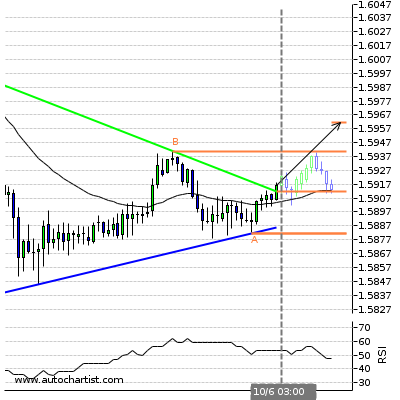 ( A ) 1.4608Last support turning point of Rising Wedge. Channel Up has broken through the support line at 03-May-05:00 2016 GMT. 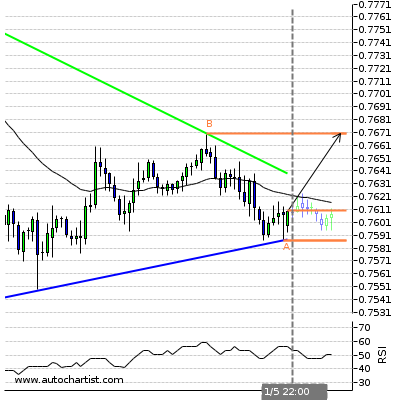 Possible bearish price movement forecast for the next 2 days towards 0.752. 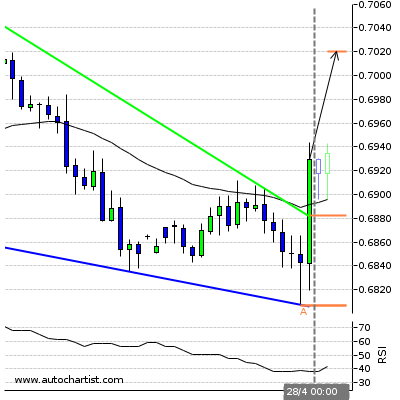 ( A ) 0.772Last resistance turning point of Channel Up. 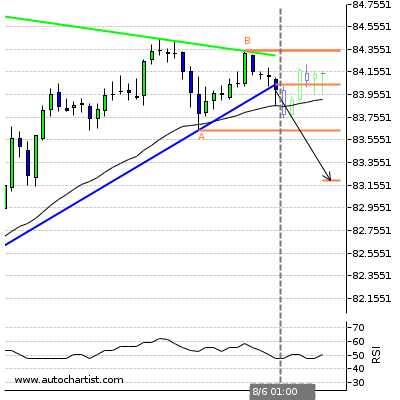 Possible bearish price movement towards the support 0.9511 within the next 4 hours. Triangle has broken through the support line at 03-May-01:00 2016 GMT. 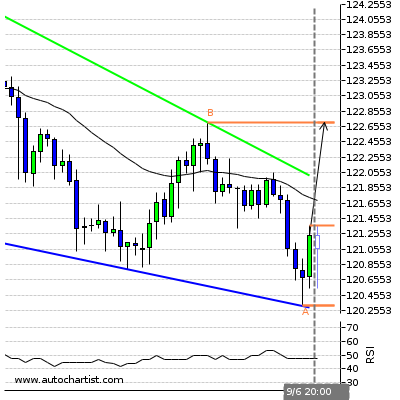 Possible bearish price movement forecast for the next 11 hours towards 1.249. ( B ) 1.2564Last resistance turning point of Triangle. 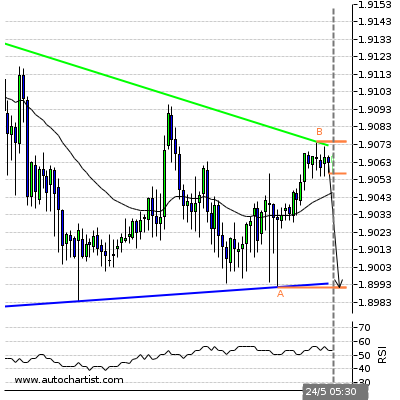 ( A ) 1.2513Last support turning point of Triangle. Channel Up has broken through the support line at 03-May-00:30 2016 GMT. 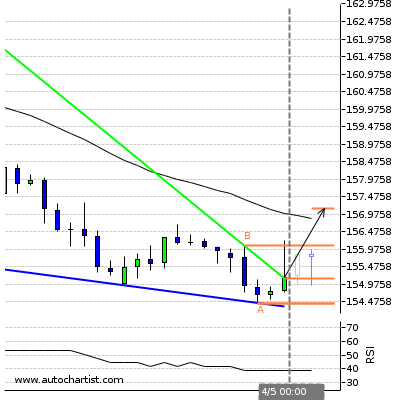 Possible bearish price movement forecast for the next 8 hours towards 155.247. ( B ) 156.583Last resistance turning point of Channel Up. 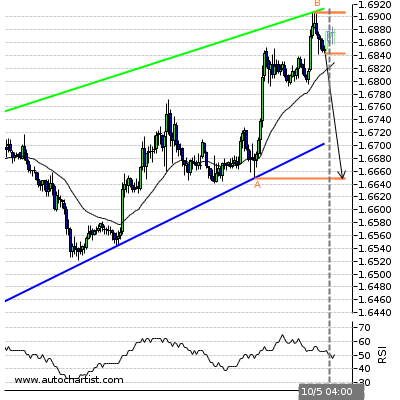 ( A ) 155.417Last support turning point of Channel Up. 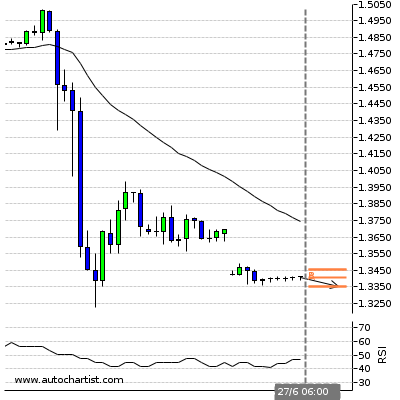 Possible bearish price movement towards the support 1.1455 within the next 4 hours. 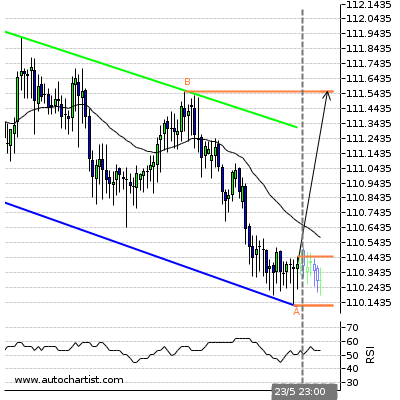 Possible bullish price movement towards the resistance 107.4191 within the next 4 hours. 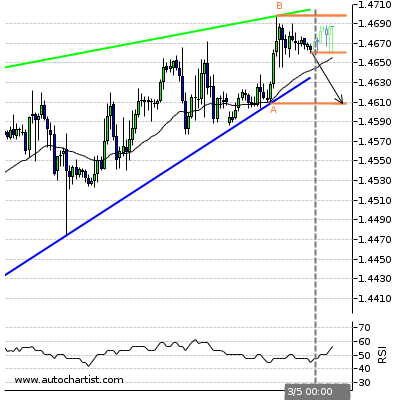 Possible bearish price movement towards the support 1.4501 within the next 4 hours. 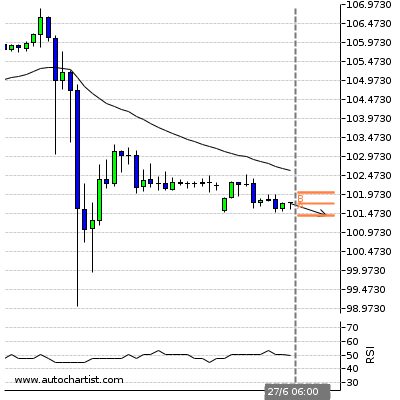 Pennant has broken through the resistance line at 04-May-00:00 2016 GMT. Possible bullish price movement forecast for the next 2 days towards 157.13. ( B ) 156.08Last resistance turning point of Pennant. ( A ) 154.421Last support turning point of Pennant. Possible bearish price movement towards the support 1.137 within the next 4 hours. 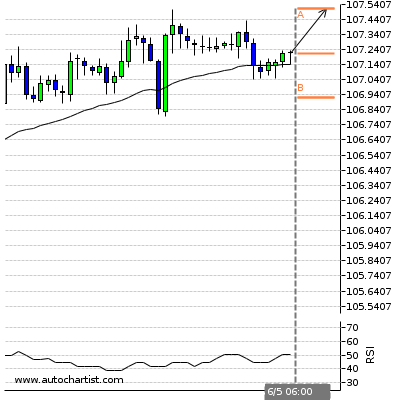 Possible bullish price movement towards the resistance 107.5076 within the next 4 hours. Triangle has broken through the support line at 06-May-04:00 2016 GMT. 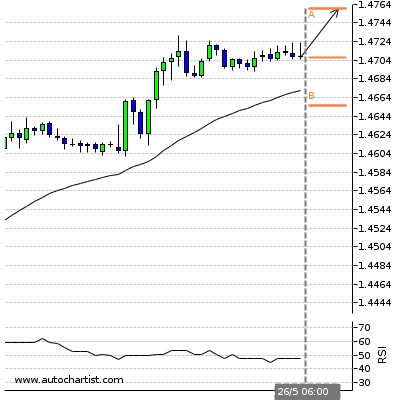 Possible bearish price movement forecast for the next 5 hours towards 1.446. 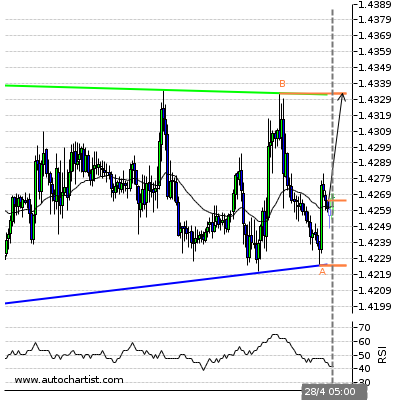 ( A ) 1.4495Last resistance turning point of Triangle. Possible bullish price movement towards the resistance 0.972 within the next 4 hours. Rising Wedge identified at 06-May-05:30 2016 GMT. This pattern is still in the process of forming. 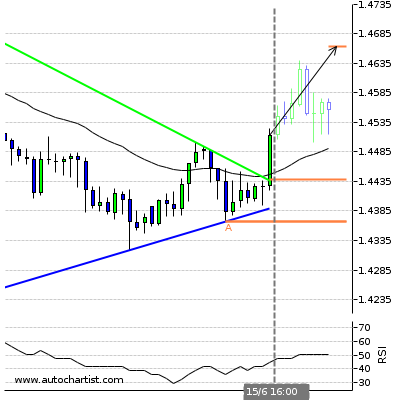 Possible bearish price movement towards the support 1.465 within the next 5 hours. ( B ) 1.4693Last resistance turning point of Rising Wedge. 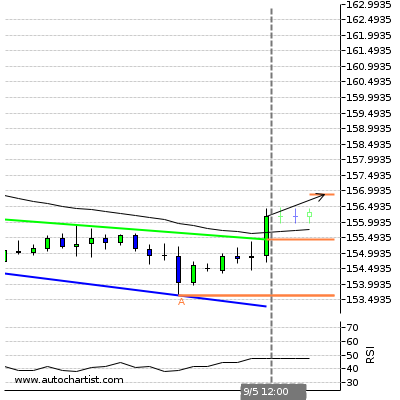 ( A ) 1.4653Last support turning point of Rising Wedge. Triangle has broken through the resistance line at 06-May-02:00 2016 GMT. 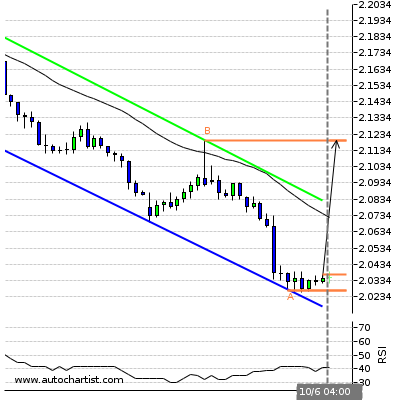 Possible bullish price movement forecast for the next 3 days towards 2.13. ( A ) 2.0949Last support turning point of Triangle. Triangle has broken through the support line at 06-May-01:00 2016 GMT. 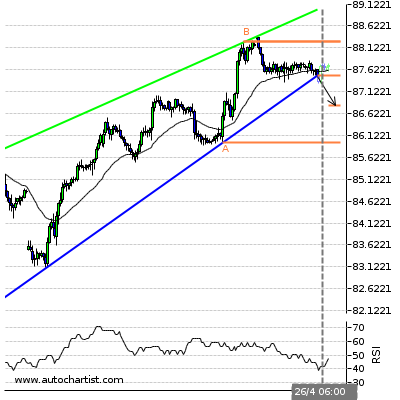 Possible bearish price movement forecast for the next 14 hours towards 82.991. ( A ) 83.5545Last resistance turning point of Triangle. Channel Down identified at 05-May-22:00 2016 GMT. This pattern is still in the process of forming. 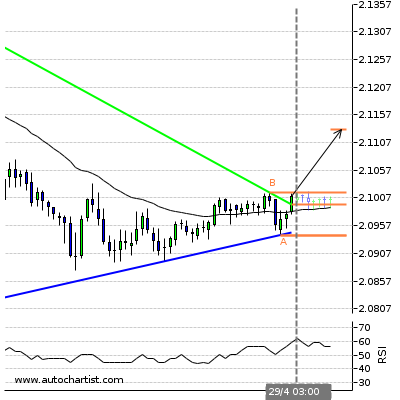 Possible bullish price movement towards the resistance 1,286.485 within the next 10 hours. ( B ) 1286.485Last resistance turning point of Channel Down. ( A ) 1269.025Last support turning point of Channel Down. Triangle identified at 05-May-20:00 2016 GMT. This pattern is still in the process of forming. Possible bearish price movement towards the support 17.171 within the next 3 days. ( B ) 17.645Last resistance turning point of Triangle. ( A ) 17.171Last support turning point of Triangle. 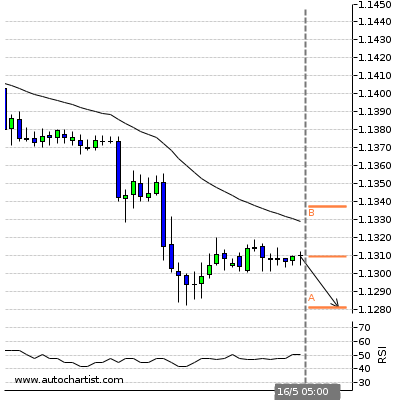 Possible bearish price movement towards the support 1.1355 within the next 4 hours. 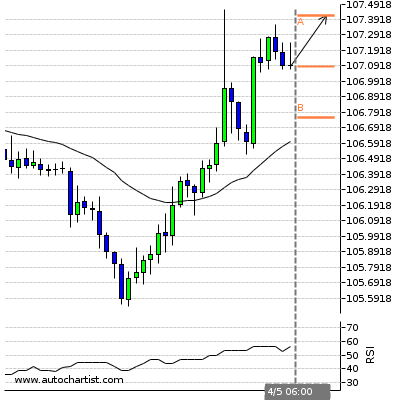 Possible bullish price movement towards the resistance 109.1088 within the next 4 hours. Triangle has broken through the support line at 10-May-05:30 2016 GMT. 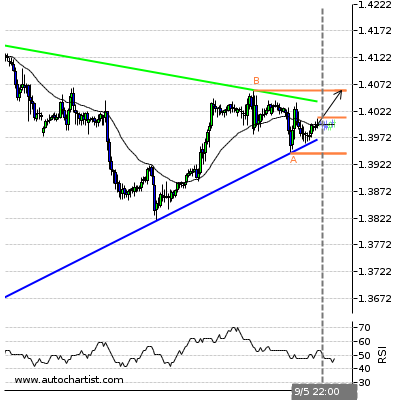 Possible bearish price movement forecast for the next 7 hours towards 1.437. ( B ) 1.4424Last resistance turning point of Triangle. 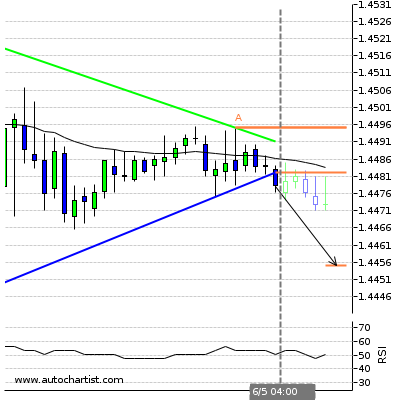 ( A ) 1.4384Last support turning point of Triangle. Ascending Triangle identified at 10-May-03:00 2016 GMT. This pattern is still in the process of forming. Possible bullish price movement towards the resistance 0.974 within the next 3 days. ( B ) 0.9737Last resistance turning point of Ascending Triangle. ( A ) 0.9701Last support turning point of Ascending Triangle. Channel Down has broken through the resistance line at 09-May-12:00 2016 GMT. 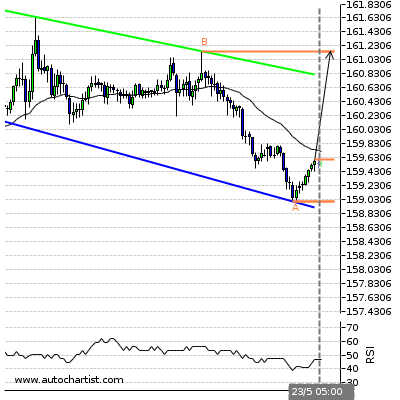 Possible bullish price movement forecast for the next 2 days towards 156.862. ( A ) 153.6255Last support turning point of Channel Down. Triangle identified at 09-May-22:00 2016 GMT. This pattern is still in the process of forming. Possible bullish price movement towards the resistance 1.406 within the next 3 days. ( B ) 1.4061Last resistance turning point of Triangle. 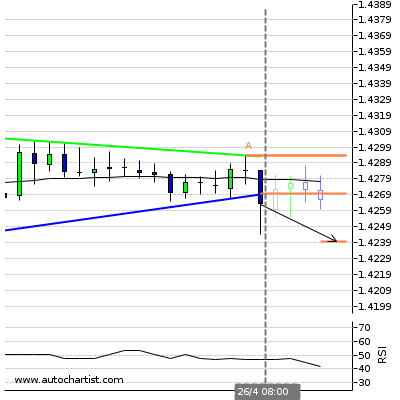 ( A ) 1.3943Last support turning point of Triangle. Channel Up identified at 09-May-19:00 2016 GMT. This pattern is still in the process of forming. Possible bearish price movement towards the support 1.47 within the next 11 hours. ( B ) 1.4826Last resistance turning point of Channel Up. 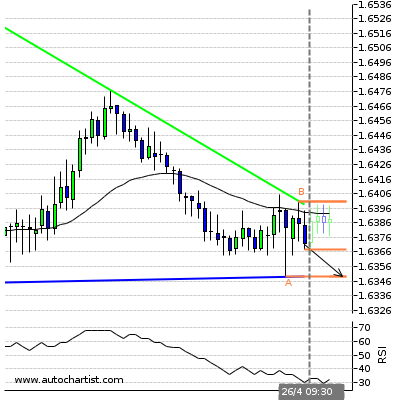 ( A ) 1.4696Last support turning point of Channel Up. Rising Wedge identified at 09-May-22:00 2016 GMT. This pattern is still in the process of forming. 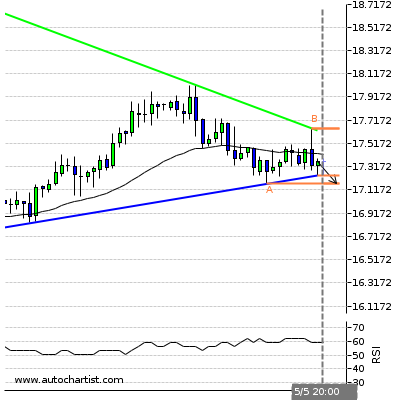 Possible bearish price movement towards the support 1.86 within the next 19 hours. ( B ) 1.8733Last resistance turning point of Rising Wedge. ( A ) 1.8603Last support turning point of Rising Wedge. Rising Wedge identified at 10-May-04:00 2016 GMT. This pattern is still in the process of forming. Possible bearish price movement towards the support 1.665 within the next 2 days. ( B ) 1.6907Last resistance turning point of Rising Wedge. ( A ) 1.6649Last support turning point of Rising Wedge. Channel Up identified at 10-May-04:00 2016 GMT. This pattern is still in the process of forming. Possible bearish price movement towards the support 2.108 within the next 2 days. ( B ) 2.1401Last resistance turning point of Channel Up. 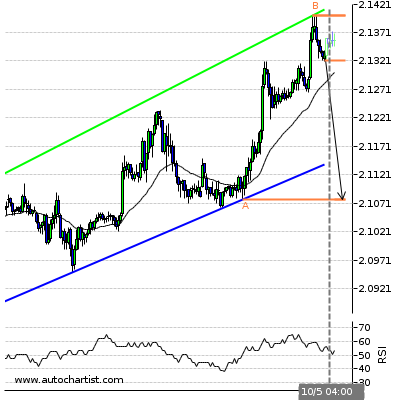 ( A ) 2.1077Last support turning point of Channel Up. Triangle has broken through the resistance line at 10-May-05:00 2016 GMT. 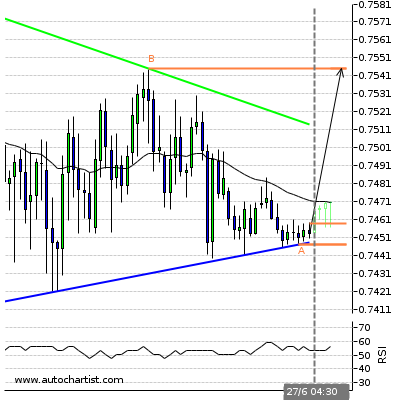 Possible bullish price movement forecast for the next 3 days towards 0.756. ( B ) 0.7543Last resistance turning point of Triangle. ( A ) 0.7455Last support turning point of Triangle. Falling Wedge has broken through the resistance line at 09-May-08:00 2016 GMT. 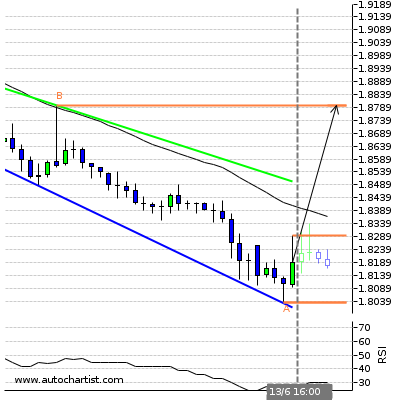 Possible bullish price movement forecast for the next 3 days towards 112.865. ( A ) 109.79Last support turning point of Falling Wedge. Triangle identified at 10-May-04:00 2016 GMT. This pattern is still in the process of forming. 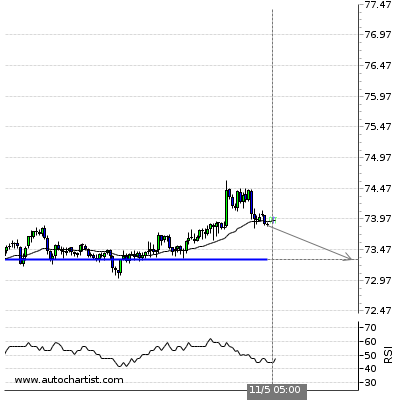 Possible bullish price movement towards the resistance 73.87 within the next 20 hours. ( B ) 73.8695Last resistance turning point of Triangle. ( A ) 73.007Last support turning point of Triangle. 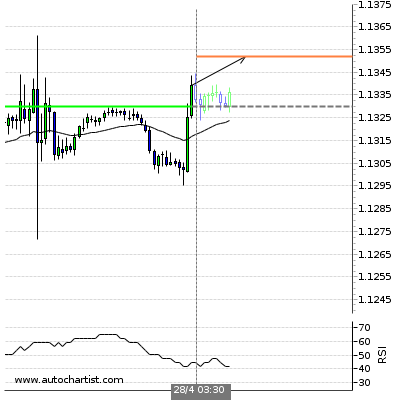 Possible bullish price movement towards the resistance 1.1418 within the next 4 hours. Channel Up identified at 11-May-04:00 2016 GMT. This pattern is still in the process of forming. Possible bearish price movement towards the support 106.436 within the next 2 days. ( B ) 109.2875Last resistance turning point of Channel Up. ( A ) 106.4365Last support turning point of Channel Up. Triangle identified at 11-May-05:30 2016 GMT. This pattern is still in the process of forming. Possible bullish price movement towards the resistance 1.447 within the next 7 hours. ( B ) 1.4469Last resistance turning point of Triangle. ( A ) 1.4439Last support turning point of Triangle. Inverse Head and Shoulders identified at 11-May-05:45 2016 GMT. This pattern is still in the process of forming. Possible bullish price movement towards the resistance 0.739 within the next 21 hours. 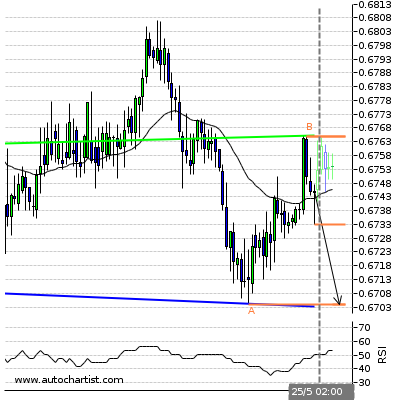 ( B ) 0.7391Last resistance turning point of Inverse Head and Shoulders. ( A ) 0.7343Last support turning point of Inverse Head and Shoulders. Rising Wedge identified at 11-May-02:00 2016 GMT. This pattern is still in the process of forming. Possible bearish price movement towards the support 0.97 within the next 2 days. ( B ) 0.9764Last resistance turning point of Rising Wedge. ( A ) 0.9699Last support turning point of Rising Wedge. Inverse Head and Shoulders has broken through the resistance line at 10-May-16:00 2016 GMT. 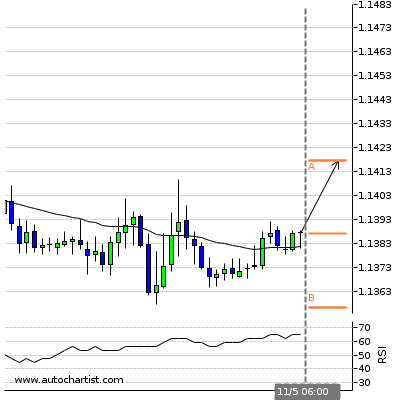 Possible bullish price movement forecast for the next 3 days towards 1.413. 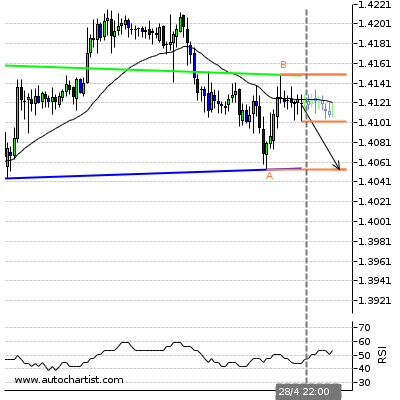 ( A ) 1.3943Last support turning point of Inverse Head and Shoulders. Ascending Triangle identified at 11-May-03:00 2016 GMT. This pattern is still in the process of forming. Possible bullish price movement towards the resistance 1.483 within the next 2 days. ( B ) 1.4826Last resistance turning point of Ascending Triangle. ( A ) 1.4678Last support turning point of Ascending Triangle. Channel Up has broken through the support line at 11-May-00:00 2016 GMT. 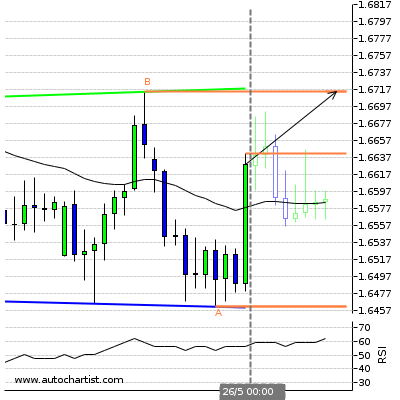 Possible bearish price movement forecast for the next 2 days towards 1.66. ( B ) 1.6932Last resistance turning point of Channel Up. ( A ) 1.6545Last support turning point of Channel Up. Channel Up identified at 11-May-00:00 2016 GMT. This pattern is still in the process of forming. Possible bearish price movement towards the support 2.095 within the next 2 days. ( B ) 2.1488Last resistance turning point of Channel Up. ( A ) 2.0949Last support turning point of Channel Up. Channel Down identified at 11-May-04:30 2016 GMT. This pattern is still in the process of forming. Possible bullish price movement towards the resistance 112.166 within the next 6 hours. ( B ) 112.1665Last resistance turning point of Channel Down. ( A ) 111.509Last support turning point of Channel Down. 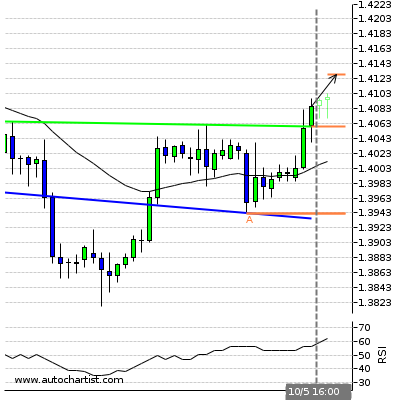 Possible bullish price movement towards the resistance 1.1459 within the next 4 hours. 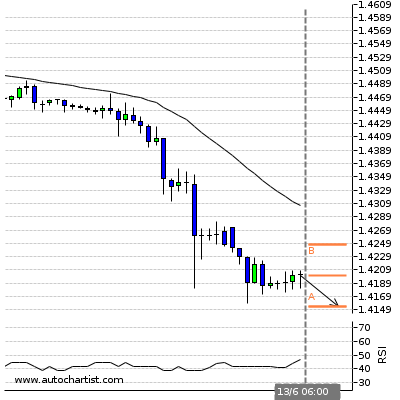 Possible bearish price movement towards the support 1.4385 within the next 4 hours. Channel Up has broken through the support line at 12-May-02:00 2016 GMT. Possible bearish price movement forecast for the next 12 hours towards 0.731. 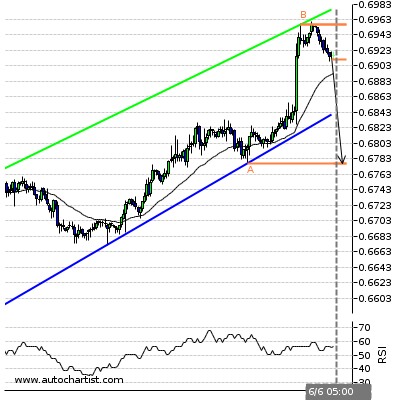 ( B ) 0.7403Last resistance turning point of Channel Up. ( A ) 0.7336Last support turning point of Channel Up. 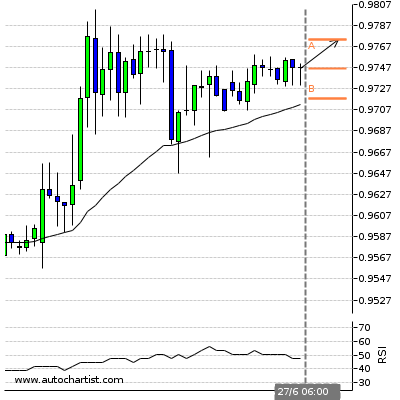 Possible bearish price movement towards the support 0.9682 within the next 4 hours. Inverse Head and Shoulders identified at 12-May-04:00 2016 GMT. This pattern is still in the process of forming. 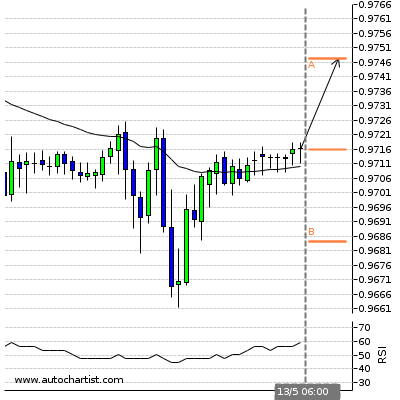 Possible bullish price movement towards the resistance 0.685 within the next 2 days. 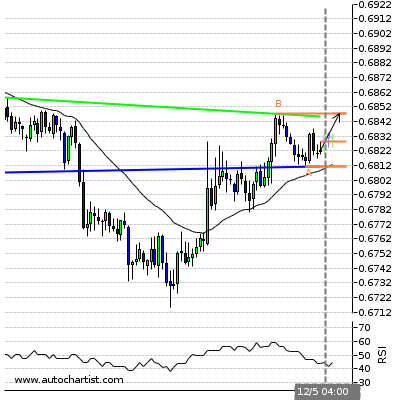 ( B ) 0.6847Last resistance turning point of Inverse Head and Shoulders. 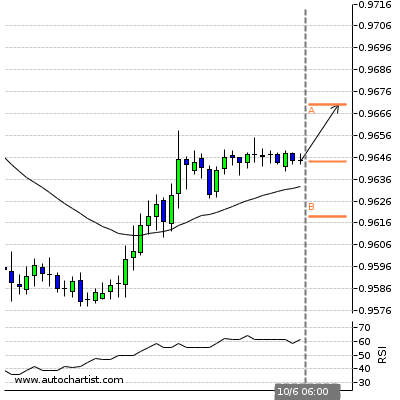 ( A ) 0.6811Last support turning point of Inverse Head and Shoulders. Falling Wedge has broken through the resistance line at 12-May-03:30 2016 GMT. 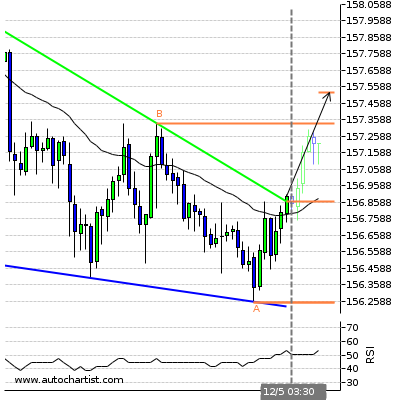 Possible bullish price movement forecast for the next 9 hours towards 157.521. ( B ) 157.336Last resistance turning point of Falling Wedge. 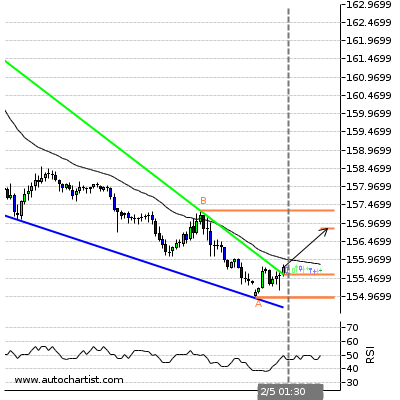 ( A ) 156.2545Last support turning point of Falling Wedge. Triangle has broken through the resistance line at 12-May-05:00 2016 GMT. 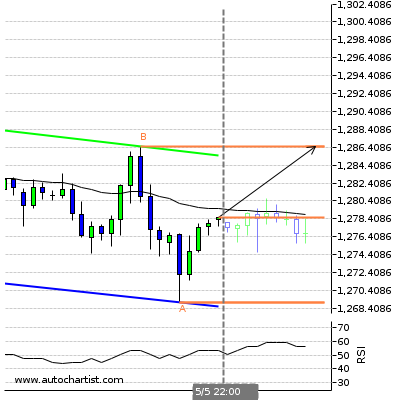 Possible bullish price movement forecast for the next 2 days towards 125.538. ( A ) 123.69Last support turning point of Triangle. ( B ) 1.4061Last resistance turning point of Inverse Head and Shoulders. Ascending Triangle identified at 12-May-04:00 2016 GMT. This pattern is still in the process of forming. Possible bullish price movement towards the resistance 1.483 within the next 2 days. ( A ) 1.4664Last support turning point of Ascending Triangle. Channel Up has broken through the support line at 11-May-16:00 2016 GMT. 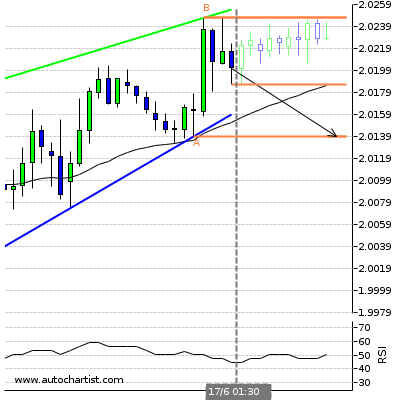 Possible bearish price movement forecast for the next 3 days towards 2.107. Triangle has broken through the resistance line at 12-May-05:00 2016 GMT. 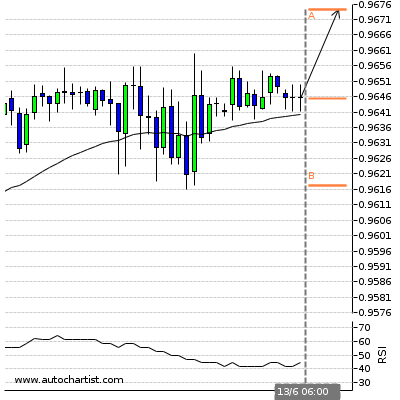 Possible bullish price movement forecast for the next 2 days towards 85.598. ( A ) 84.1725Last support turning point of Triangle. Channel Up identified at 12-May-04:00 2016 GMT. This pattern is still in the process of forming. 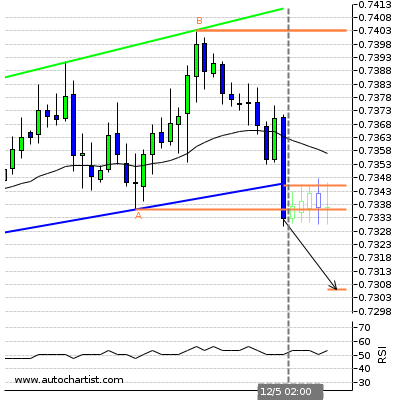 Possible bearish price movement towards the support 0.746 within the next 2 days. 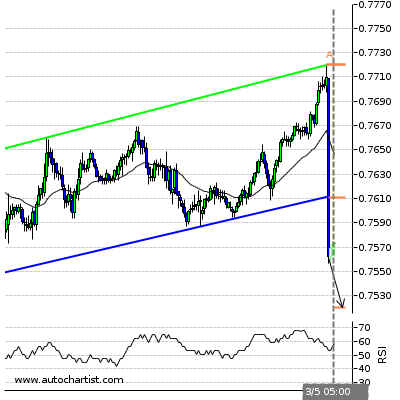 ( B ) 0.7575Last resistance turning point of Channel Up. ( A ) 0.7455Last support turning point of Channel Up. 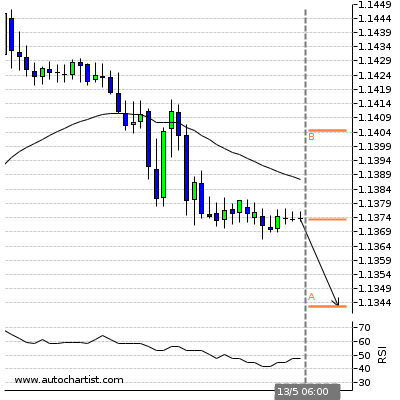 Possible bearish price movement towards the support 1.1343 within the next 4 hours. Possible bearish price movement towards the support 108.4525 within the next 4 hours. 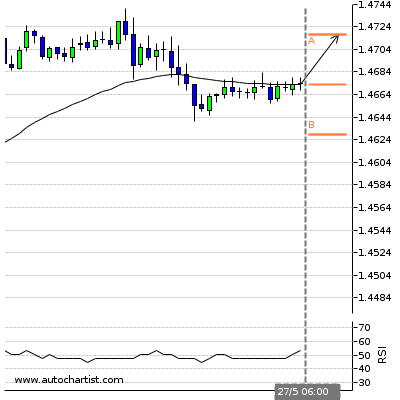 Possible bearish price movement towards the support 1.4397 within the next 4 hours. Possible bullish price movement towards the resistance 0.9747 within the next 4 hours. 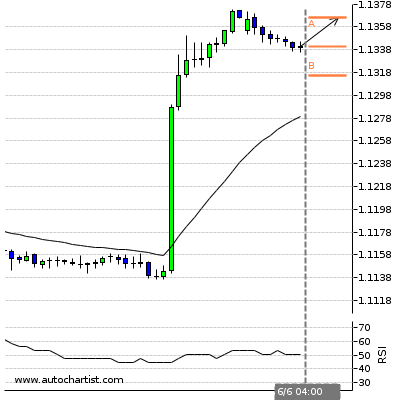 Possible bearish price movement towards the support 1.1282 within the next 4 hours. Rising Wedge has broken through the support line at 13-May-20:00 2016 GMT. Possible bearish price movement forecast for the next 2 days towards 108. ( B ) 109.5645Last resistance turning point of Rising Wedge. ( A ) 108.515Last support turning point of Rising Wedge. 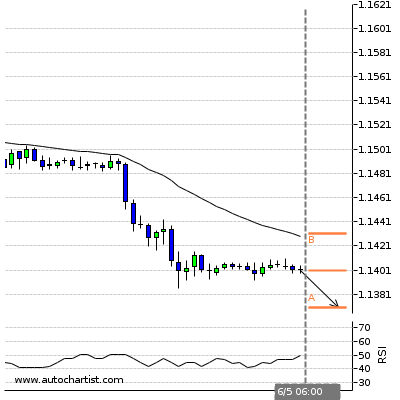 Possible bearish price movement towards the support 1.4312 within the next 4 hours. Falling Wedge identified at 16-May-04:00 2016 GMT. This pattern is still in the process of forming. Possible bullish price movement towards the resistance 0.74 within the next 3 days. 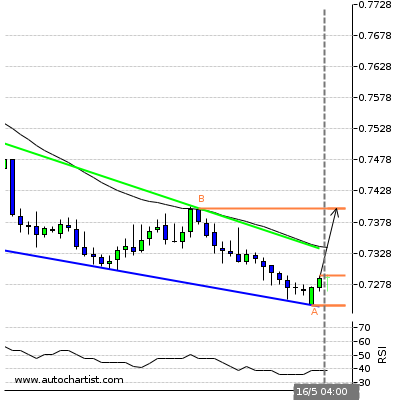 ( B ) 0.74Last resistance turning point of Falling Wedge. 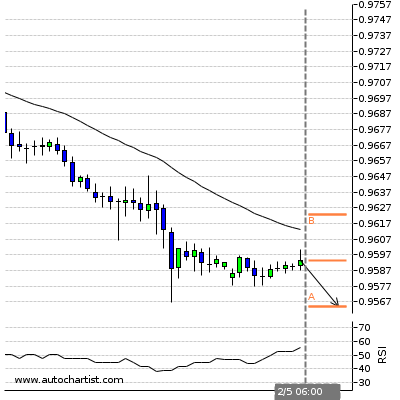 ( A ) 0.7244Last support turning point of Falling Wedge. Possible bullish price movement towards the resistance 0.9779 within the next 4 hours. Triangle identified at 16-May-05:00 2016 GMT. This pattern is still in the process of forming. 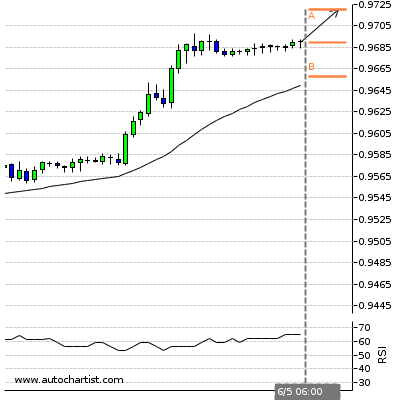 Possible bullish price movement towards the resistance 0.685 within the next 3 days. ( B ) 0.6849Last resistance turning point of Triangle. ( A ) 0.6745Last support turning point of Triangle. Channel Down identified at 16-May-01:30 2016 GMT. This pattern is still in the process of forming. 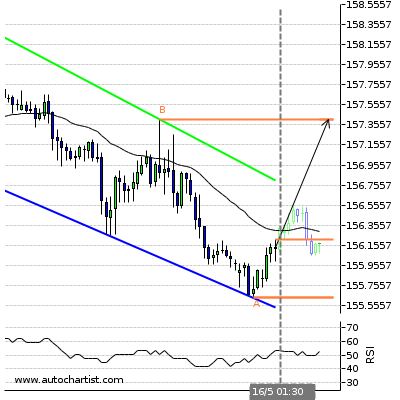 Possible bullish price movement towards the resistance 157.41 within the next 11 hours. ( B ) 157.4105Last resistance turning point of Channel Down. 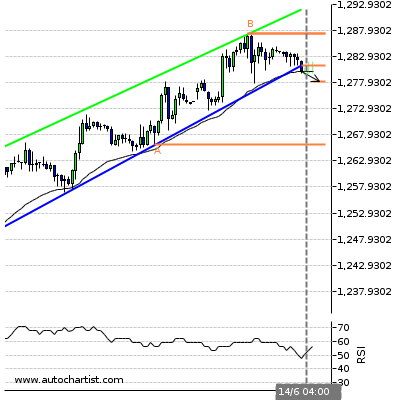 ( A ) 155.64Last support turning point of Channel Down. Channel Down identified at 16-May-01:00 2016 GMT. This pattern is still in the process of forming. 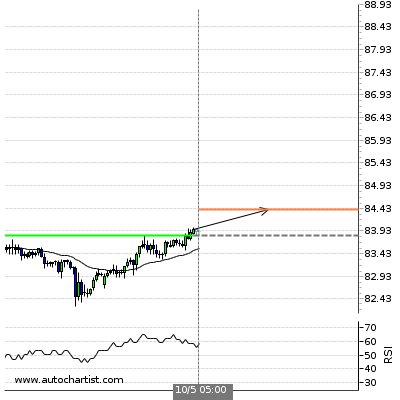 Possible bullish price movement towards the resistance 84.935 within the next 11 hours. ( B ) 84.935Last resistance turning point of Channel Down. ( A ) 83.68Last support turning point of Channel Down. Channel Up identified at 13-May-12:00 2016 GMT. This pattern is still in the process of forming. 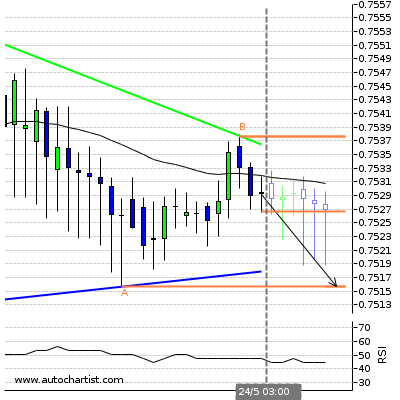 Possible bearish price movement towards the support 0.746 within the next 3 days. 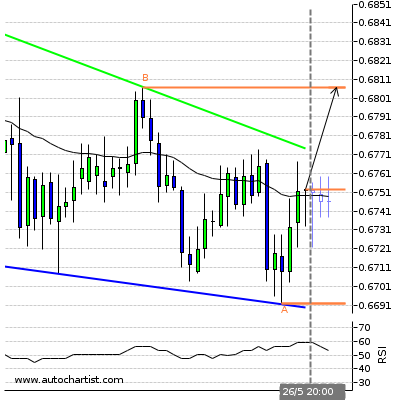 ( B ) 0.7595Last resistance turning point of Channel Up. Channel Down identified at 16-May-01:00 2016 GMT. This pattern is still in the process of forming. Possible bullish price movement towards the resistance 112.3 within the next 11 hours. ( B ) 112.3Last resistance turning point of Channel Down. ( A ) 111.14Last support turning point of Channel Down. Channel Down identified at 16-May-01:00 2016 GMT. This pattern is still in the process of forming. 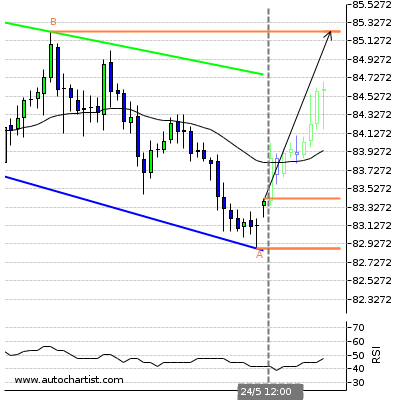 Possible bullish price movement towards the resistance 74.248 within the next 10 hours. ( B ) 74.248Last resistance turning point of Channel Down. ( A ) 73.3Last support turning point of Channel Down. Triangle identified at 13-May-20:00 2016 GMT. This pattern is still in the process of forming. Possible bullish price movement towards the resistance 1,280.9 within the next 2 days. ( B ) 1280.9Last resistance turning point of Triangle. ( A ) 1263.24Last support turning point of Triangle. 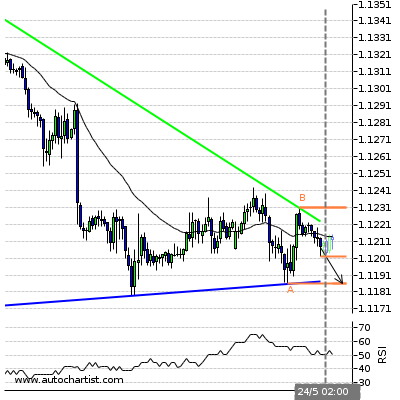 Possible bearish price movement towards the support 1.1284 within the next 4 hours. Falling Wedge has broken through the resistance line at 17-May-04:00 2016 GMT. Possible bullish price movement forecast for the next 3 days towards 0.743. Possible bullish price movement towards the resistance 0.9802 within the next 4 hours. Triangle identified at 16-May-08:00 2016 GMT. This pattern is still in the process of forming. Possible bullish price movement towards the resistance 0.685 within the next 3 days. Triangle has broken through the support line at 17-May-04:00 2016 GMT. 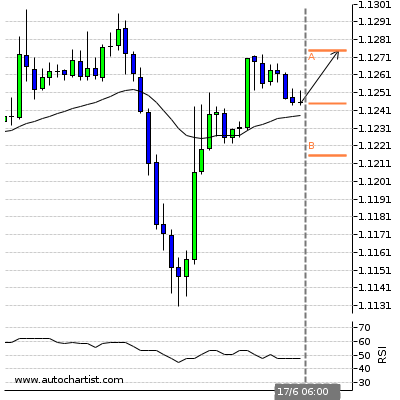 Possible bearish price movement forecast for the next 7 hours towards 123.136. ( B ) 123.46Last resistance turning point of Triangle. ( A ) 123.22Last support turning point of Triangle. Descending Triangle identified at 17-May-03:00 2016 GMT. This pattern is still in the process of forming. Possible bearish price movement towards the support 1.1 within the next 9 hours. 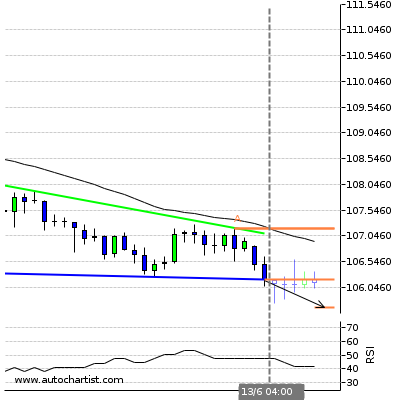 ( B ) 1.107Last resistance turning point of Descending Triangle. 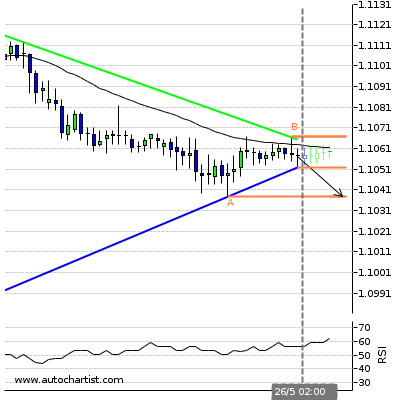 ( A ) 1.1001Last support turning point of Descending Triangle. Channel Down identified at 20-May-08:00 2016 GMT. This pattern is still in the process of forming. Possible bullish price movement towards the resistance 1.135 within the next 3 days. ( B ) 1.1348Last resistance turning point of Channel Down. 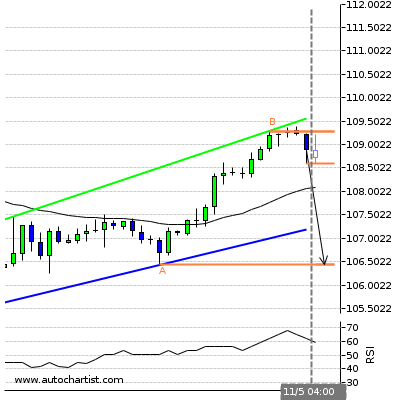 ( A ) 1.1179Last support turning point of Channel Down. Channel Down identified at 22-May-23:00 2016 GMT. This pattern is still in the process of forming. 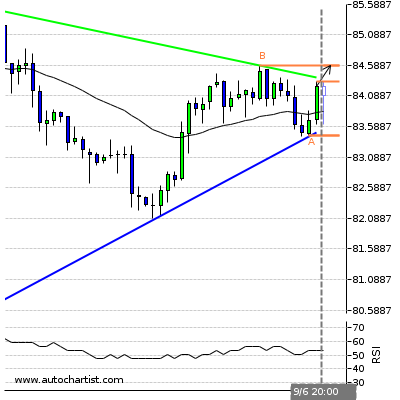 Possible bullish price movement towards the resistance 1.461 within the next 12 hours. ( B ) 1.4613Last resistance turning point of Channel Down. 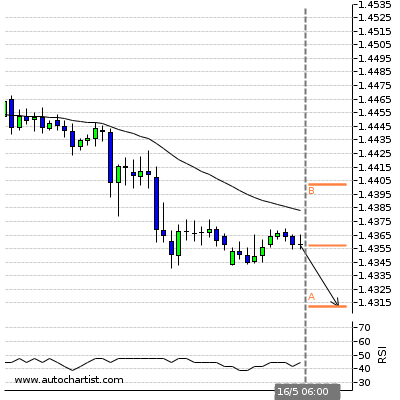 ( A ) 1.4484Last support turning point of Channel Down. Channel Down identified at 23-May-05:00 2016 GMT. This pattern is still in the process of forming. 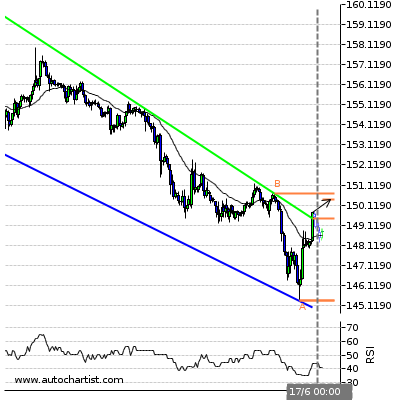 Possible bullish price movement towards the resistance 161.15 within the next 16 hours. ( B ) 161.15Last resistance turning point of Channel Down. ( A ) 158.999Last support turning point of Channel Down. Triangle has broken through the resistance line at 20-May-12:00 2016 GMT. 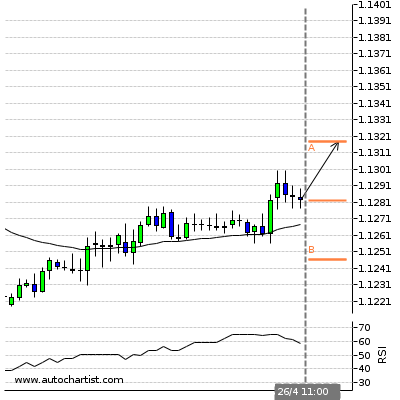 Possible bullish price movement forecast for the next 3 days towards 124.544. ( B ) 124.2Last resistance turning point of Triangle. ( A ) 122.9Last support turning point of Triangle. Triangle identified at 23-May-04:00 2016 GMT. This pattern is still in the process of forming. 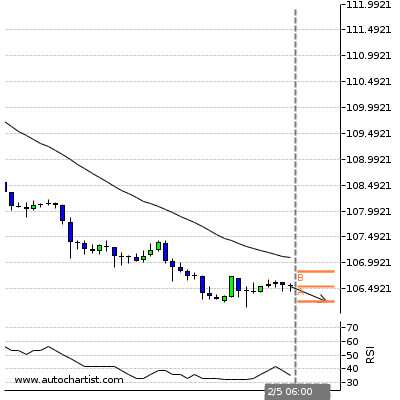 Possible bearish price movement towards the support 1.109 within the next 10 hours. ( B ) 1.1123Last resistance turning point of Triangle. 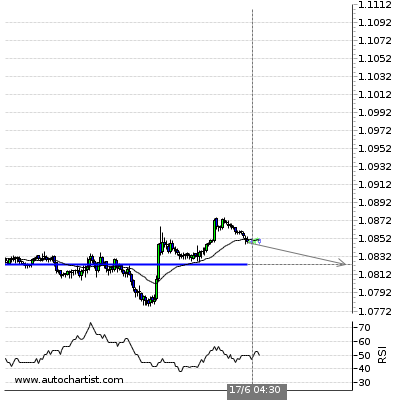 ( A ) 1.1089Last support turning point of Triangle. Falling Wedge has broken through the resistance line at 23-May-05:15 2016 GMT. 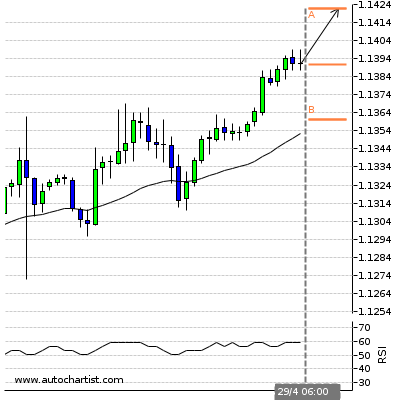 Possible bullish price movement forecast for the next 12 hours towards 1.438. 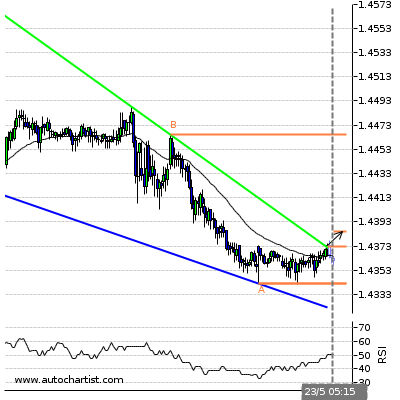 ( B ) 1.4465Last resistance turning point of Falling Wedge. 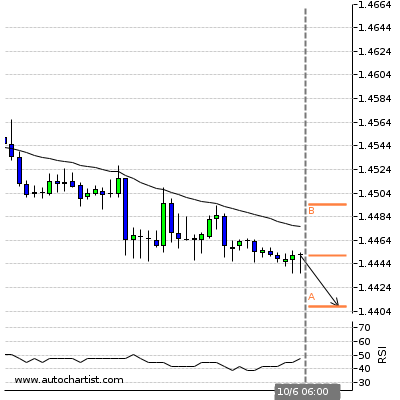 ( A ) 1.4342Last support turning point of Falling Wedge. Triangle identified at 23-May-05:00 2016 GMT. This pattern is still in the process of forming. 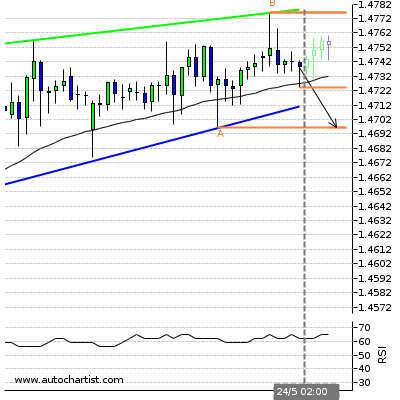 Possible bearish price movement towards the support 1.468 within the next 9 hours. ( B ) 1.4728Last resistance turning point of Triangle. ( A ) 1.4676Last support turning point of Triangle. Channel Down identified at 23-May-03:15 2016 GMT. This pattern is still in the process of forming. 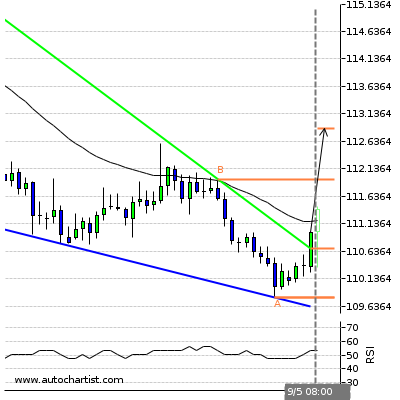 Possible bullish price movement towards the resistance 1.913 within the next 11 hours. ( B ) 1.9132Last resistance turning point of Channel Down. ( A ) 1.8984Last support turning point of Channel Down. Falling Wedge identified at 23-May-04:45 2016 GMT. This pattern is still in the process of forming. Possible bullish price movement towards the resistance 2.142 within the next 5 hours. ( B ) 2.1419Last resistance turning point of Falling Wedge. 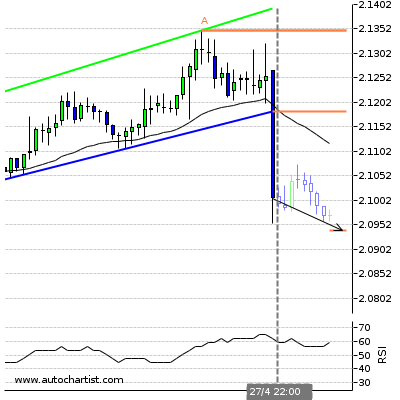 ( A ) 2.1339Last support turning point of Falling Wedge. Triangle identified at 23-May-04:00 2016 GMT. This pattern is still in the process of forming. Possible bullish price movement towards the resistance 84.326 within the next 19 hours. ( B ) 84.326Last resistance turning point of Triangle. ( A ) 83.61Last support turning point of Triangle. Triangle has broken through the resistance line at 20-May-08:00 2016 GMT. 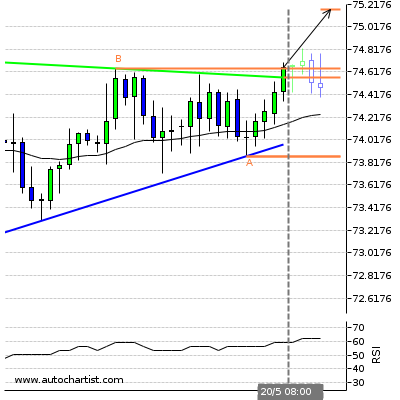 Possible bullish price movement forecast for the next 2 days towards 75.173. ( B ) 74.645Last resistance turning point of Triangle. ( A ) 73.873Last support turning point of Triangle. Descending Triangle identified at 24-May-02:00 2016 GMT. This pattern is still in the process of forming. 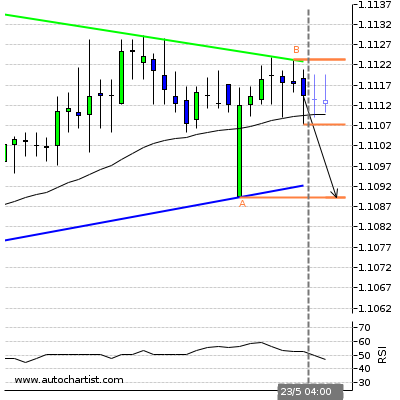 Possible bearish price movement towards the support 1.119 within the next 2 days. ( B ) 1.1231Last resistance turning point of Descending Triangle. 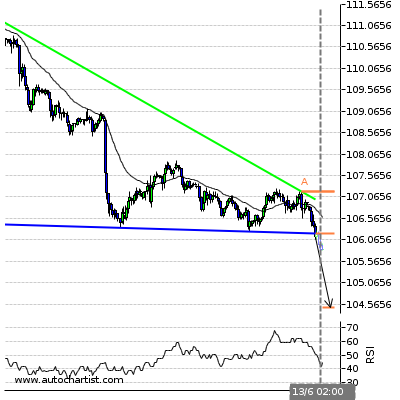 ( A ) 1.1186Last support turning point of Descending Triangle. 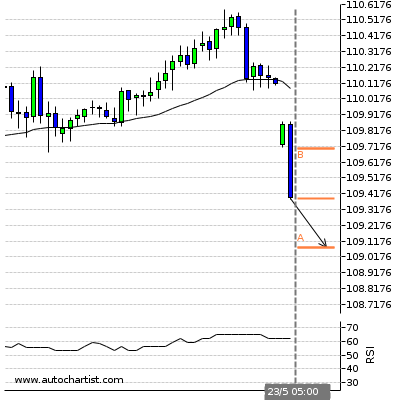 Possible bearish price movement towards the support 109.0739 within the next 4 hours. 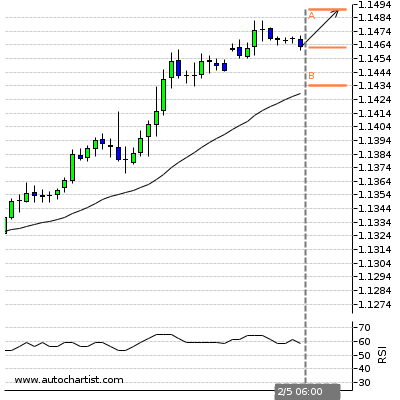 Possible bearish price movement towards the support 1.444 within the next 4 hours. Possible bullish price movement towards the resistance 0.9939 within the next 4 hours. Descending Triangle has broken through the support line at 24-May-01:00 2016 GMT. 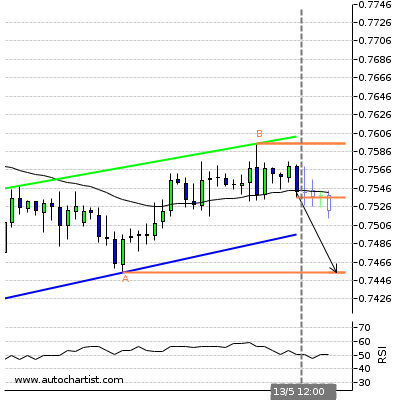 Possible bearish price movement forecast for the next 11 hours towards 0.672. 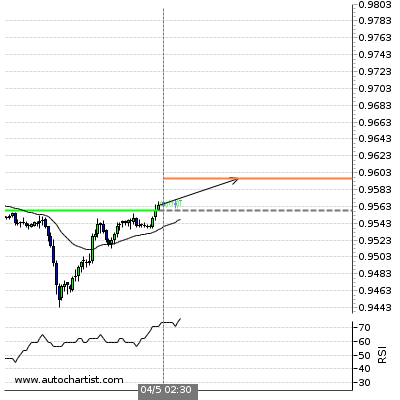 ( A ) 0.6766Last resistance turning point of Descending Triangle. Triangle has broken through the support line at 23-May-08:00 2016 GMT. 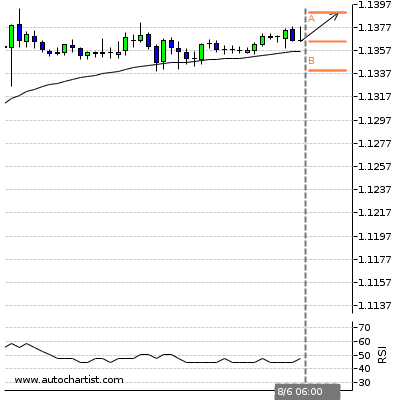 Possible bearish price movement forecast for the next 2 days towards 122.336. ( A ) 124.041Last resistance turning point of Triangle. Rising Wedge identified at 24-May-02:00 2016 GMT. This pattern is still in the process of forming. 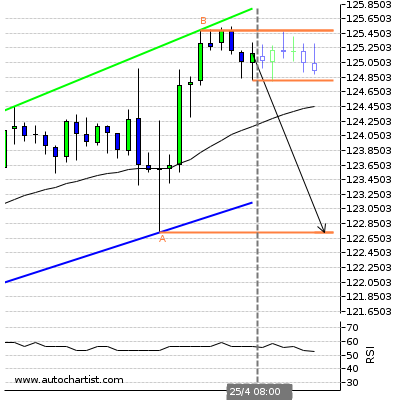 Possible bearish price movement towards the support 1.47 within the next 14 hours. ( B ) 1.4776Last resistance turning point of Rising Wedge. ( A ) 1.4696Last support turning point of Rising Wedge. Triangle identified at 24-May-05:30 2016 GMT. This pattern is still in the process of forming. 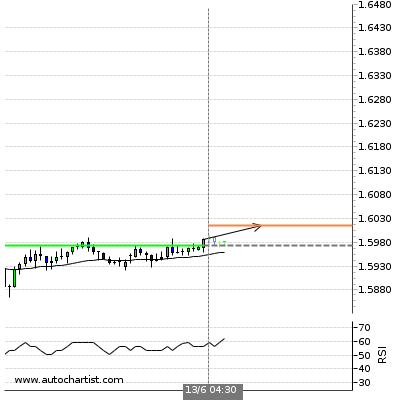 Possible bearish price movement towards the support 1.899 within the next 14 hours. 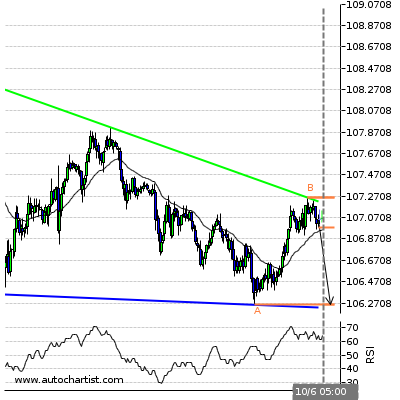 ( B ) 1.9075Last resistance turning point of Triangle. ( A ) 1.8992Last support turning point of Triangle. Triangle identified at 24-May-03:00 2016 GMT. This pattern is still in the process of forming. 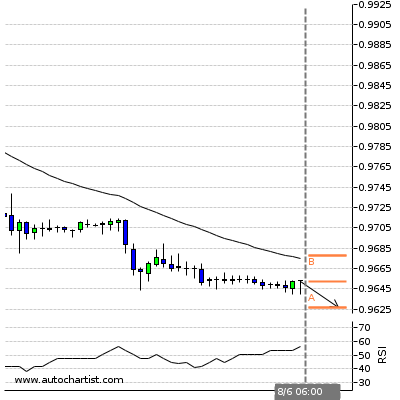 Possible bearish price movement towards the support 0.752 within the next 5 hours. ( B ) 0.7538Last resistance turning point of Triangle. ( A ) 0.7516Last support turning point of Triangle. Channel Down identified at 23-May-23:00 2016 GMT. This pattern is still in the process of forming. 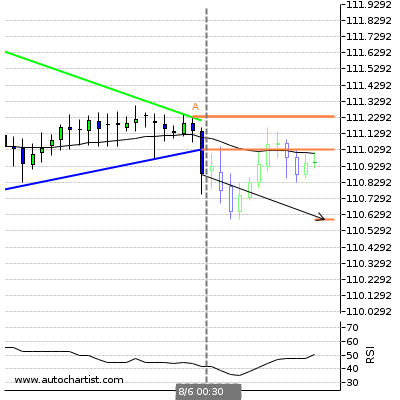 Possible bullish price movement towards the resistance 111.56 within the next 2 days. ( B ) 111.56Last resistance turning point of Channel Down. ( A ) 110.121Last support turning point of Channel Down. Falling Wedge has broken through the resistance line at 26-May-04:00 2016 GMT. 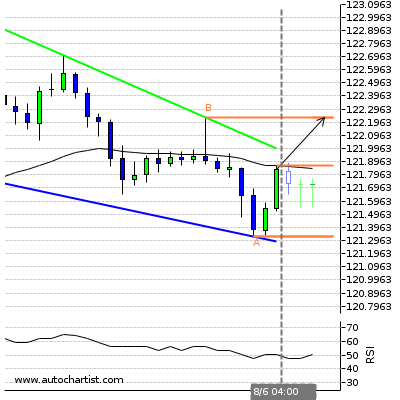 Possible bullish price movement forecast for the next 3 days towards 1.122. 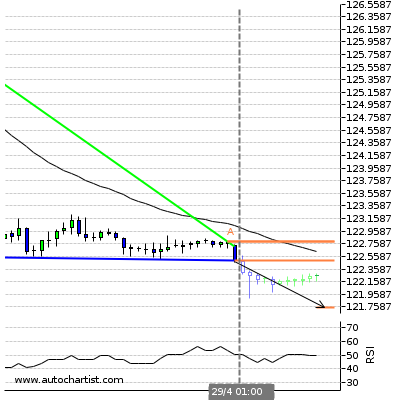 ( B ) 1.1227Last resistance turning point of Falling Wedge. 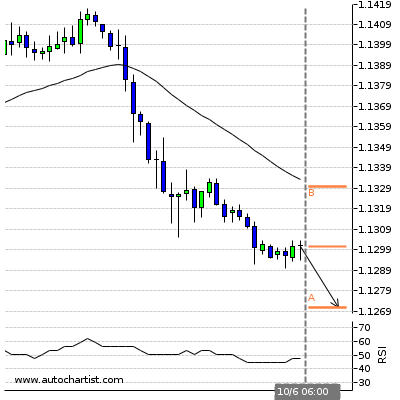 ( A ) 1.1133Last support turning point of Falling Wedge. Triangle identified at 26-May-04:00 2016 GMT. This pattern is still in the process of forming. Possible bearish price movement towards the support 109.14 within the next 3 days. ( B ) 110.4575Last resistance turning point of Triangle. 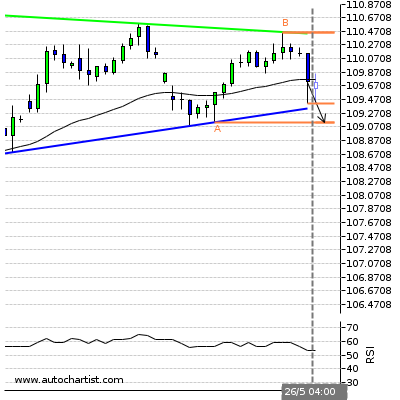 ( A ) 109.14Last support turning point of Triangle. Possible bullish price movement towards the resistance 1.4759 within the next 4 hours. Triangle has broken through the resistance line at 26-May-02:30 2016 GMT. Possible bullish price movement forecast for the next 23 hours towards 0.725. 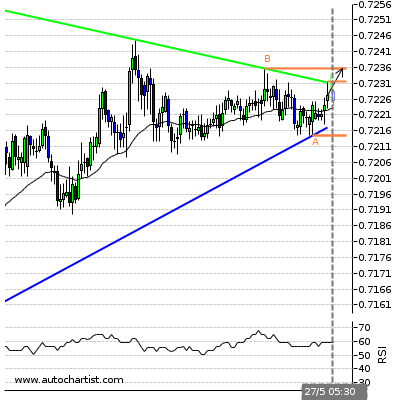 ( B ) 0.722Last resistance turning point of Triangle. ( A ) 0.7161Last support turning point of Triangle. Rising Wedge has broken through the support line at 25-May-04:00 2016 GMT. 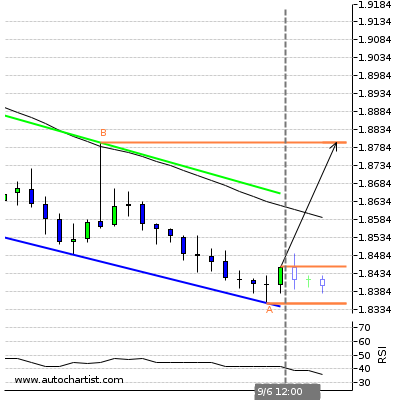 Possible bearish price movement forecast for the next 3 days towards 0.983. ( A ) 0.9939Last resistance turning point of Rising Wedge. Head and Shoulders has broken through the support line at 26-May-02:00 2016 GMT. 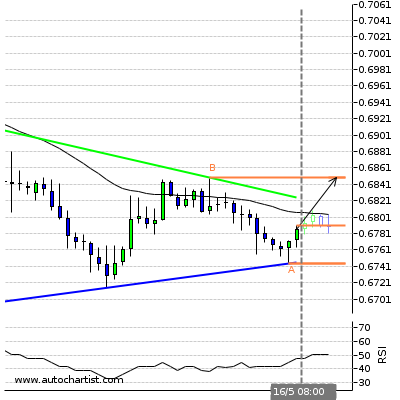 Possible bearish price movement forecast for the next 2 days towards 0.668. 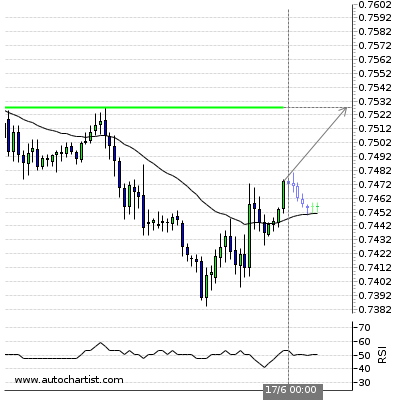 ( B ) 0.6774Last resistance turning point of Head and Shoulders. 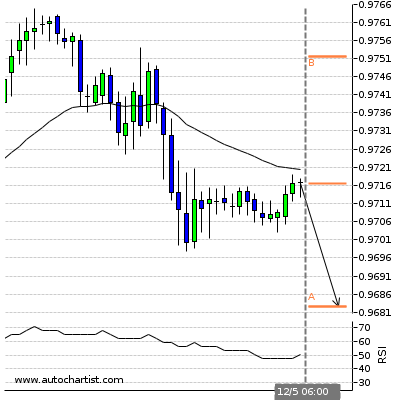 ( A ) 0.6704Last support turning point of Head and Shoulders. Channel Up identified at 26-May-04:00 2016 GMT. This pattern is still in the process of forming. 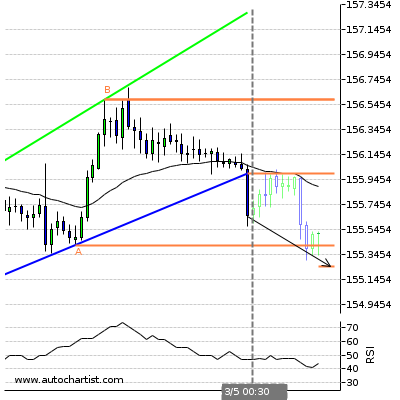 Possible bearish price movement towards the support 158.09 within the next 3 days. ( B ) 162.537Last resistance turning point of Channel Up. ( A ) 158.09Last support turning point of Channel Up. Triangle identified at 26-May-02:00 2016 GMT. This pattern is still in the process of forming. 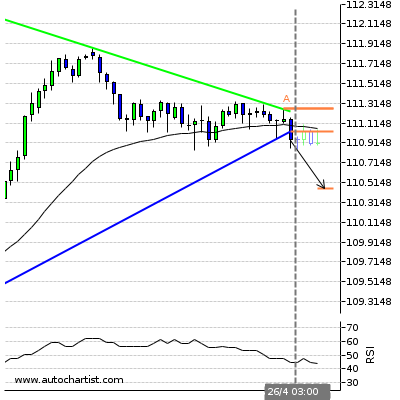 Possible bearish price movement towards the support 1.104 within the next 17 hours. 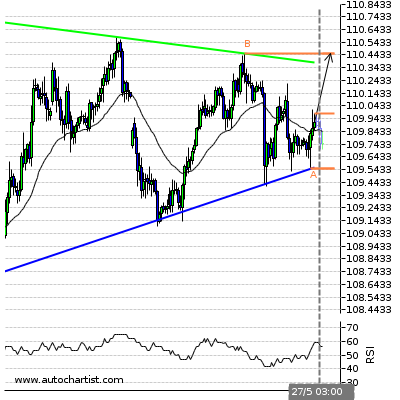 ( B ) 1.1067Last resistance turning point of Triangle. 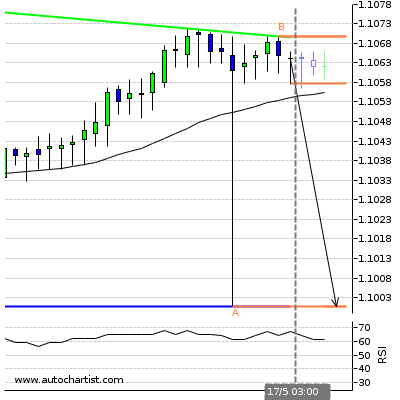 ( A ) 1.1038Last support turning point of Triangle. Channel Up identified at 26-May-04:00 2016 GMT. This pattern is still in the process of forming. Possible bearish price movement towards the support 1.42 within the next 3 days. 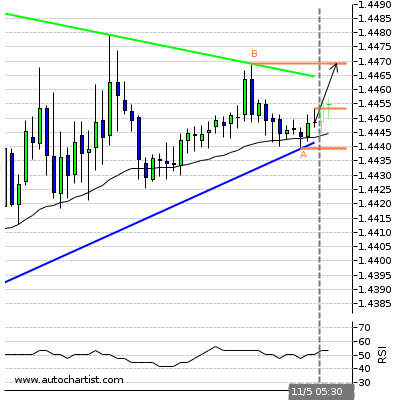 ( B ) 1.4604Last resistance turning point of Channel Up. 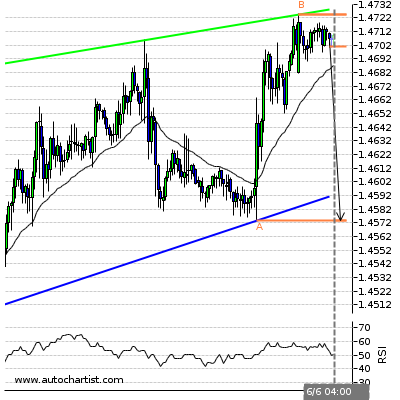 ( A ) 1.4196Last support turning point of Channel Up. Rising Wedge has broken through the support line at 26-May-00:00 2016 GMT. 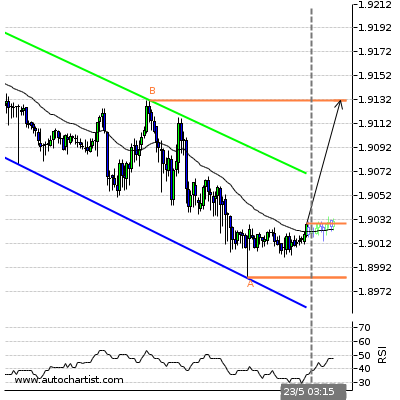 Possible bearish price movement forecast for the next 2 days towards 1.905. ( B ) 1.9308Last resistance turning point of Rising Wedge. ( A ) 1.8992Last support turning point of Rising Wedge. Rectangle identified at 26-May-00:00 2016 GMT. This pattern is still in the process of forming. 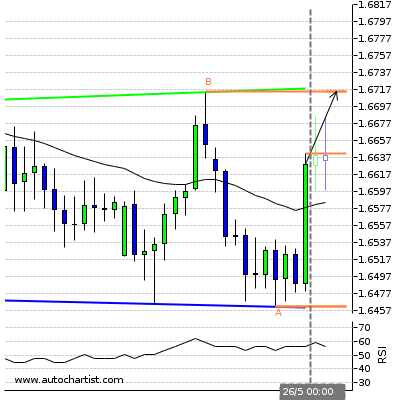 Possible bullish price movement towards the resistance 1.671 within the next 2 days. ( B ) 1.6714Last resistance turning point of Rectangle. ( A ) 1.6462Last support turning point of Rectangle. Channel Up identified at 26-May-05:00 2016 GMT. This pattern is still in the process of forming. Possible bearish price movement towards the support 2.163 within the next 18 hours. ( B ) 2.1967Last resistance turning point of Channel Up. ( A ) 2.1634Last support turning point of Channel Up. Channel Down identified at 24-May-12:00 2016 GMT. This pattern is still in the process of forming. Possible bullish price movement towards the resistance 85.225 within the next 3 days. ( B ) 85.225Last resistance turning point of Channel Down. ( A ) 82.88Last support turning point of Channel Down. Rising Wedge has broken through the support line at 26-May-05:30 2016 GMT. 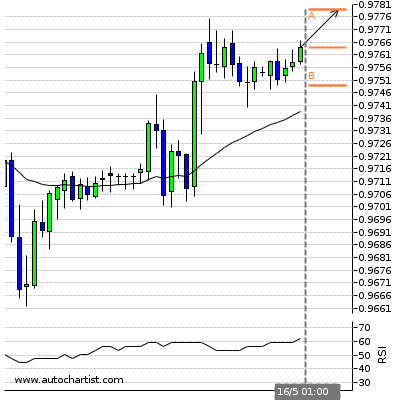 Possible bearish price movement forecast for the next 10 hours towards 0.76. ( B ) 0.7625Last resistance turning point of Rising Wedge. ( A ) 0.7599Last support turning point of Rising Wedge. Descending Triangle identified at 26-May-04:00 2016 GMT. This pattern is still in the process of forming. 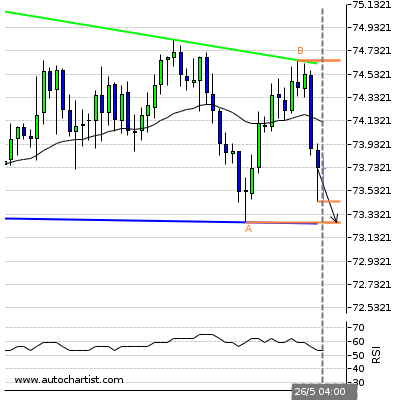 Possible bearish price movement towards the support 73.265 within the next 3 days. ( B ) 74.649Last resistance turning point of Descending Triangle. ( A ) 73.265Last support turning point of Descending Triangle. Triangle identified at 27-May-03:00 2016 GMT. This pattern is still in the process of forming. 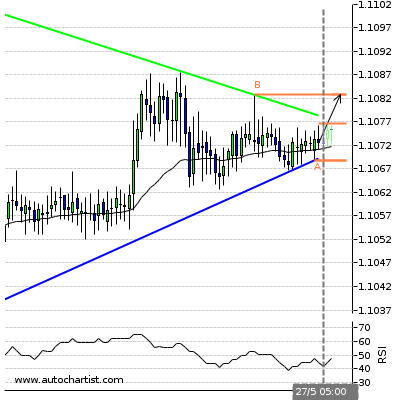 Possible bullish price movement towards the resistance 110.458 within the next 3 days. ( A ) 109.5515Last support turning point of Triangle. Possible bullish price movement towards the resistance 1.4717 within the next 4 hours. Triangle identified at 27-May-05:30 2016 GMT. This pattern is still in the process of forming. Possible bullish price movement towards the resistance 0.724 within the next 9 hours. 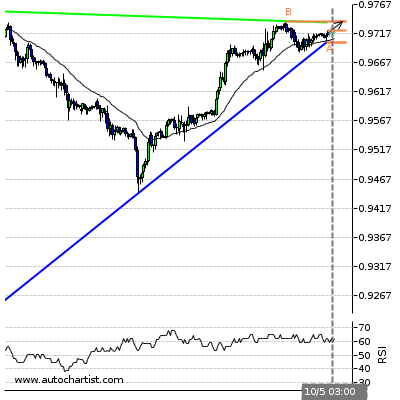 ( B ) 0.7236Last resistance turning point of Triangle. ( A ) 0.7215Last support turning point of Triangle. 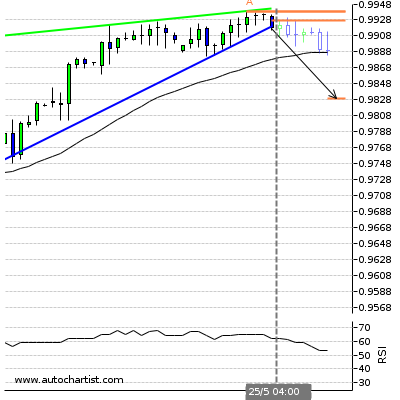 Possible bearish price movement towards the support 0.9863 within the next 4 hours. Falling Wedge identified at 26-May-20:00 2016 GMT. This pattern is still in the process of forming. 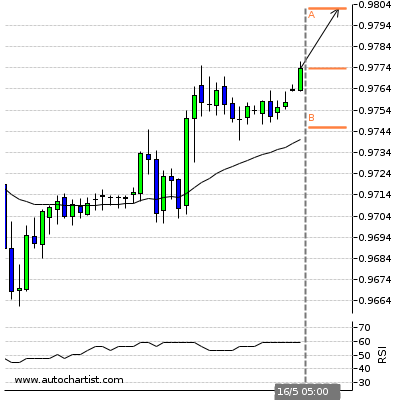 Possible bullish price movement towards the resistance 0.681 within the next 3 days. 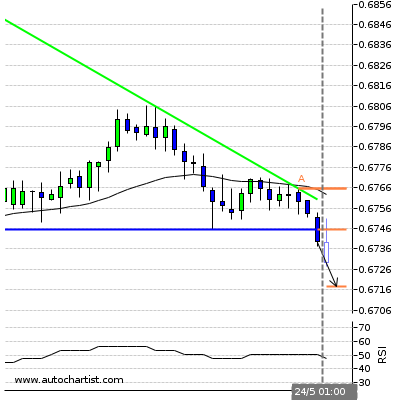 ( B ) 0.6807Last resistance turning point of Falling Wedge. 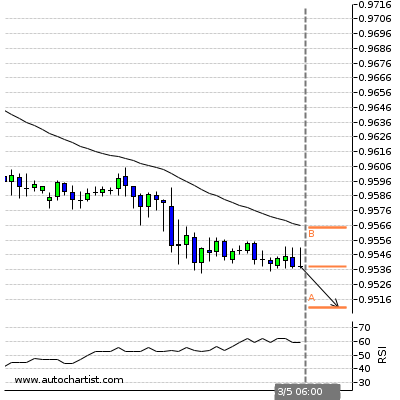 ( A ) 0.6692Last support turning point of Falling Wedge. Triangle identified at 27-May-05:00 2016 GMT. This pattern is still in the process of forming. 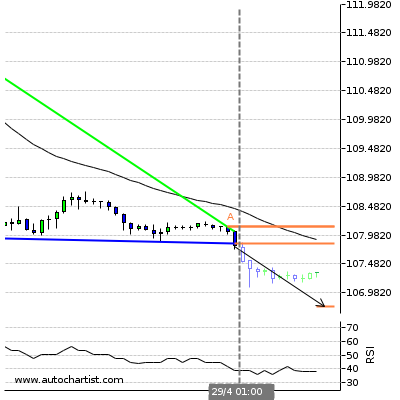 Possible bullish price movement towards the resistance 1.108 within the next 12 hours. 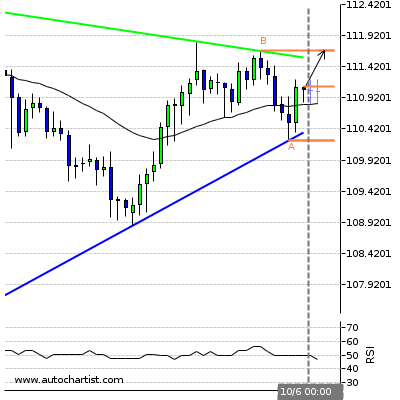 ( B ) 1.1083Last resistance turning point of Triangle. 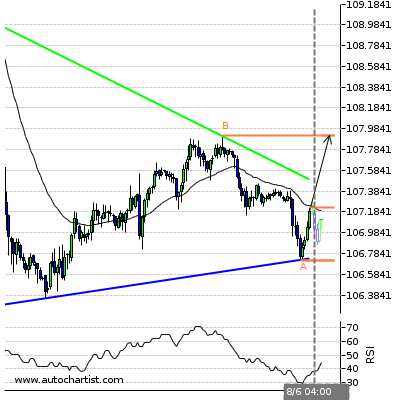 ( A ) 1.1069Last support turning point of Triangle. Channel Up identified at 26-May-12:00 2016 GMT. This pattern is still in the process of forming. 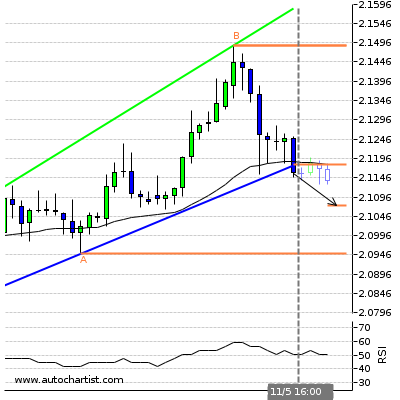 Possible bearish price movement towards the support 2.132 within the next 3 days. ( B ) 2.2003Last resistance turning point of Channel Up. 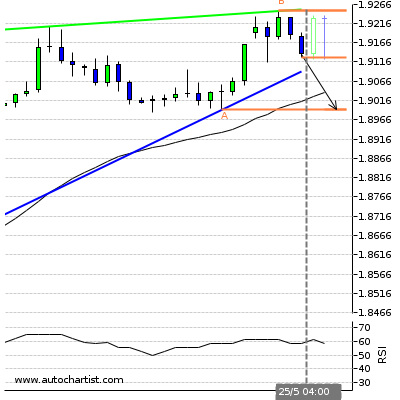 ( A ) 2.1318Last support turning point of Channel Up. Possible bullish price movement towards the resistance 1.1366 within the next 4 hours. 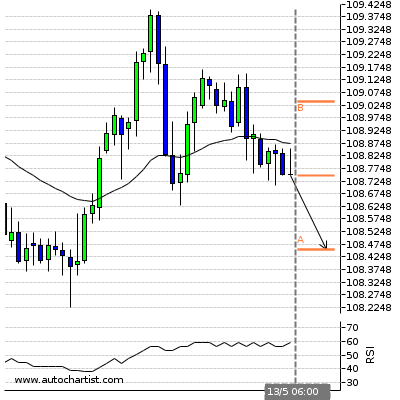 Possible bearish price movement towards the support 106.6829 within the next 4 hours. 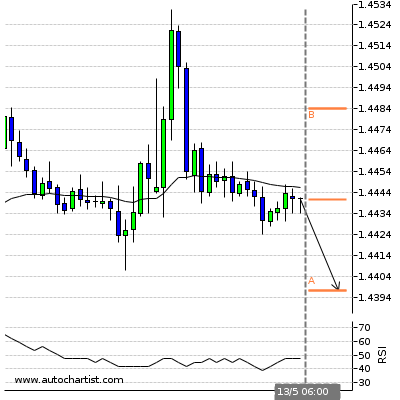 Possible bearish price movement towards the support 1.4352 within the next 4 hours. Possible bearish price movement towards the support 0.9743 within the next 4 hours. Channel Up identified at 06-Jun-05:00 2016 GMT. This pattern is still in the process of forming. 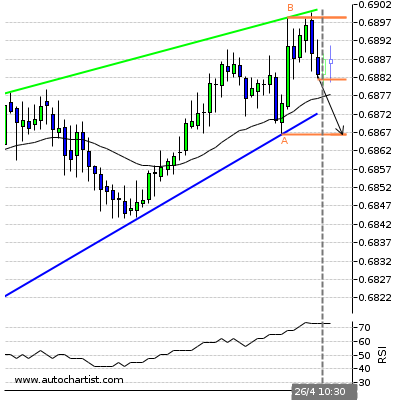 Possible bearish price movement towards the support 0.678 within the next 3 days. 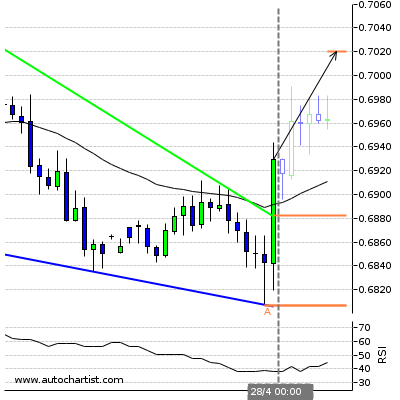 ( B ) 0.6957Last resistance turning point of Channel Up. 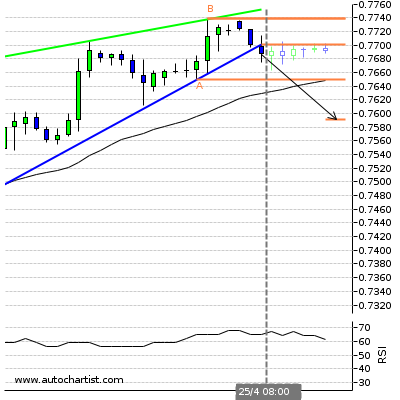 ( A ) 0.6777Last support turning point of Channel Up. Falling Wedge has broken through the resistance line at 06-Jun-03:30 2016 GMT. 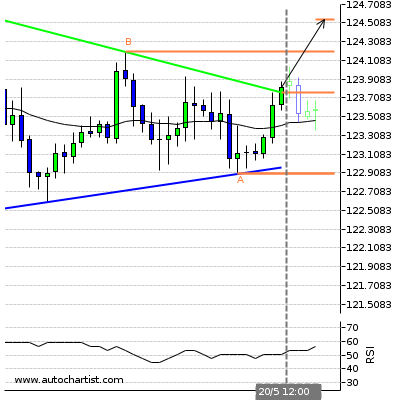 Possible bullish price movement forecast for the next 12 hours towards 121.769. 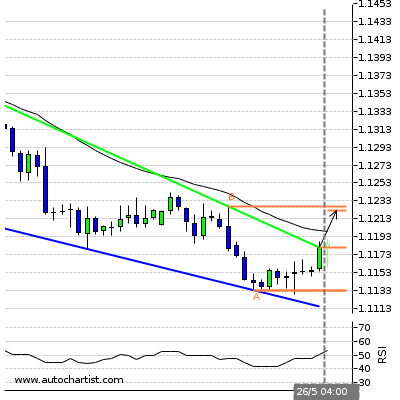 ( B ) 121.674Last resistance turning point of Falling Wedge. 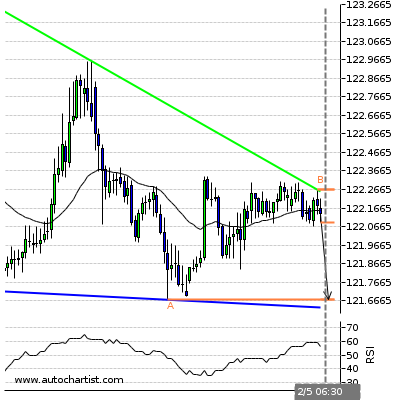 ( A ) 120.79Last support turning point of Falling Wedge. Channel Up identified at 06-Jun-04:00 2016 GMT. This pattern is still in the process of forming. 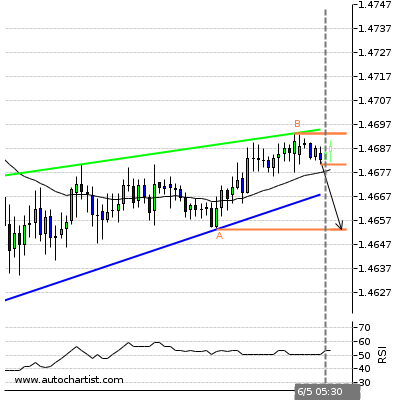 Possible bearish price movement towards the support 1.457 within the next 23 hours. 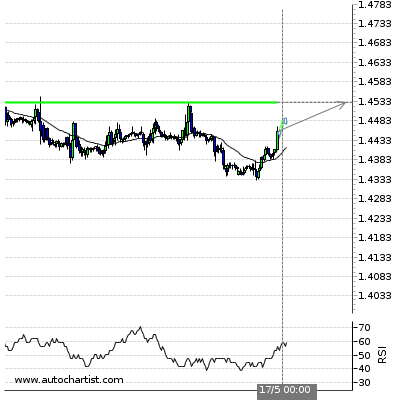 ( B ) 1.4725Last resistance turning point of Channel Up. 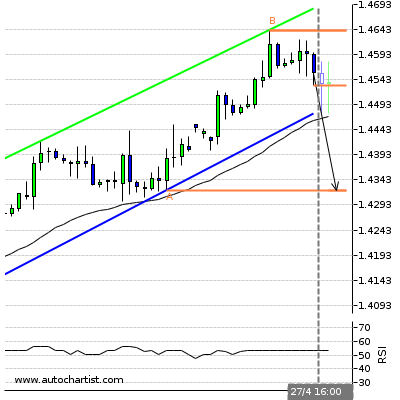 ( A ) 1.4574Last support turning point of Channel Up. Triangle has broken through the resistance line at 06-Jun-01:00 2016 GMT. Possible bullish price movement forecast for the next 8 hours towards 1.642. ( A ) 1.6332Last support turning point of Triangle. Channel Down identified at 06-Jun-03:00 2016 GMT. This pattern is still in the process of forming. 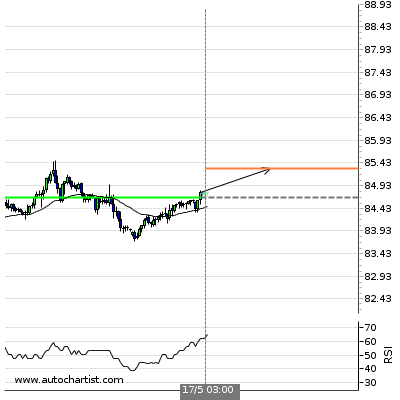 Possible bullish price movement towards the resistance 83.277 within the next 2 days. ( B ) 83.277Last resistance turning point of Channel Down. ( A ) 82.08Last support turning point of Channel Down. Channel Down identified at 06-Jun-02:00 2016 GMT. This pattern is still in the process of forming. Possible bullish price movement towards the resistance 110.05 within the next 13 hours. ( B ) 110.05Last resistance turning point of Channel Down. ( A ) 109.0008Last support turning point of Channel Down. Possible bullish price movement towards the resistance 1.139 within the next 4 hours. Triangle identified at 08-Jun-04:00 2016 GMT. This pattern is still in the process of forming. 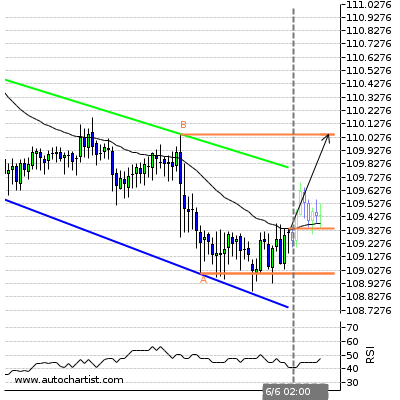 Possible bullish price movement towards the resistance 107.915 within the next 21 hours. ( B ) 107.915Last resistance turning point of Triangle. ( A ) 106.7185Last support turning point of Triangle. 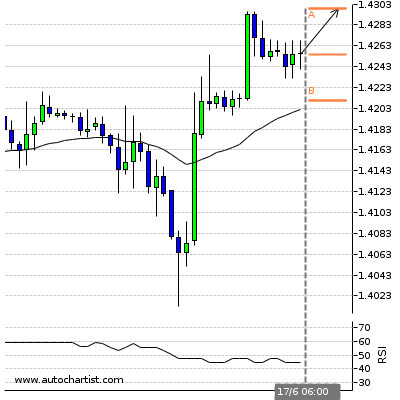 Possible bullish price movement towards the resistance 1.4601 within the next 4 hours. 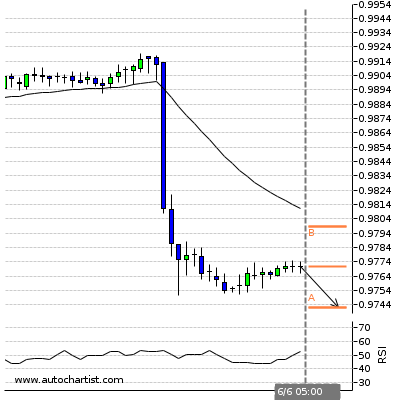 Possible bearish price movement towards the support 0.9627 within the next 4 hours. Descending Triangle identified at 08-Jun-05:30 2016 GMT. This pattern is still in the process of forming. 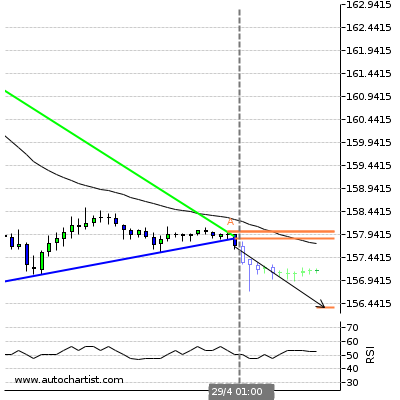 Possible bearish price movement towards the support 155.154 within the next 9 hours. ( B ) 156.113Last resistance turning point of Descending Triangle. ( A ) 155.1545Last support turning point of Descending Triangle. Falling Wedge identified at 08-Jun-04:00 2016 GMT. This pattern is still in the process of forming. Possible bullish price movement towards the resistance 122.234 within the next 8 hours. 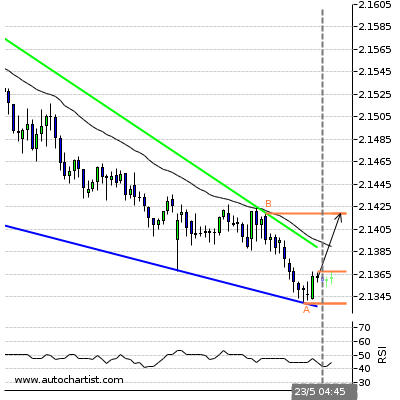 ( B ) 122.234Last resistance turning point of Falling Wedge. 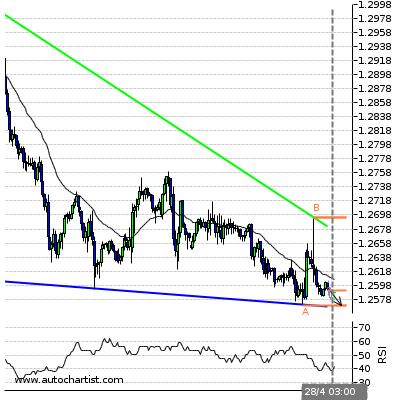 ( A ) 121.328Last support turning point of Falling Wedge. Channel Down identified at 07-Jun-08:00 2016 GMT. This pattern is still in the process of forming. 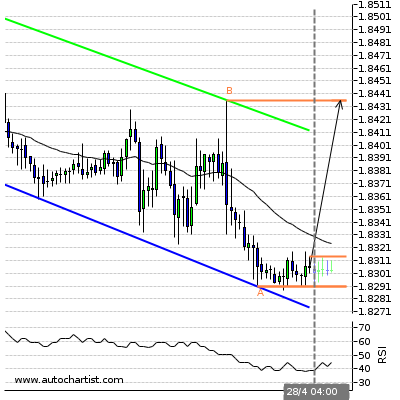 Possible bullish price movement towards the resistance 1.892 within the next 3 days. ( B ) 1.8918Last resistance turning point of Channel Down. 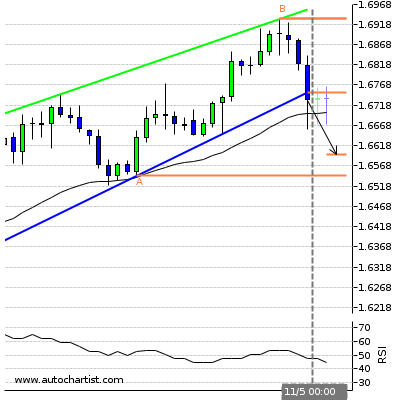 ( A ) 1.8486Last support turning point of Channel Down. Triangle has broken through the support line at 08-Jun-01:00 2016 GMT. Possible bearish price movement forecast for the next 13 hours towards 83.199. ( B ) 84.343Last resistance turning point of Triangle. ( A ) 83.6375Last support turning point of Triangle. Triangle has broken through the support line at 08-Jun-00:30 2016 GMT. 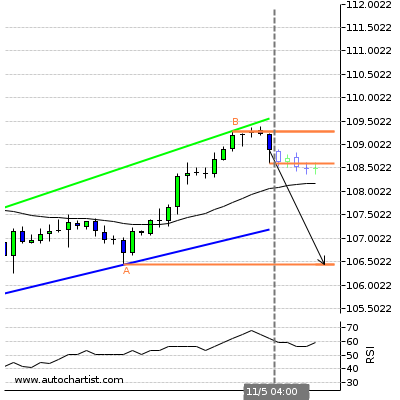 Possible bearish price movement forecast for the next 5 hours towards 110.598. ( A ) 111.2325Last resistance turning point of Triangle. 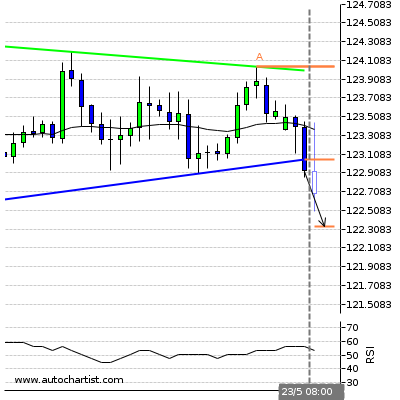 Possible bearish price movement towards the support 1.1271 within the next 4 hours. Descending Triangle identified at 10-Jun-05:00 2016 GMT. This pattern is still in the process of forming. 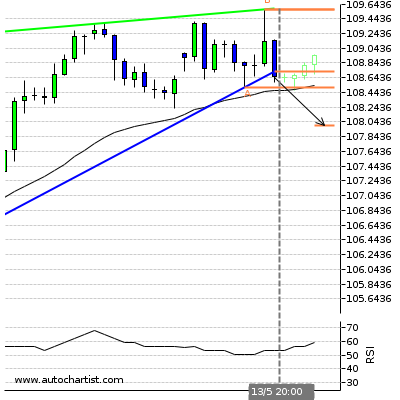 Possible bearish price movement towards the support 106.256 within the next 2 days. ( B ) 107.2605Last resistance turning point of Descending Triangle. ( A ) 106.2565Last support turning point of Descending Triangle. 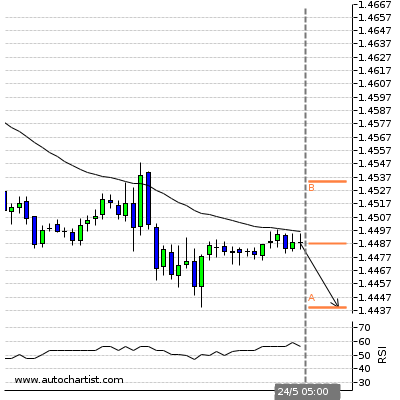 Possible bearish price movement towards the support 1.4408 within the next 4 hours. Possible bullish price movement towards the resistance 0.967 within the next 4 hours. Channel Up identified at 10-Jun-00:00 2016 GMT. This pattern is still in the process of forming. 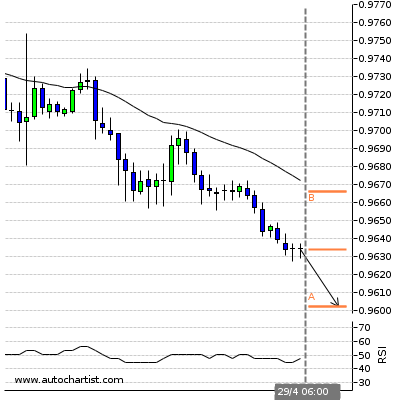 Possible bearish price movement towards the support 0.689 within the next 2 days. 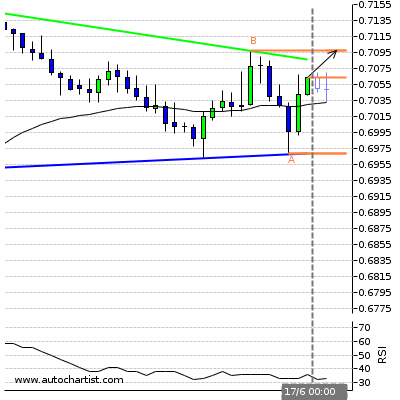 ( B ) 0.714Last resistance turning point of Channel Up. 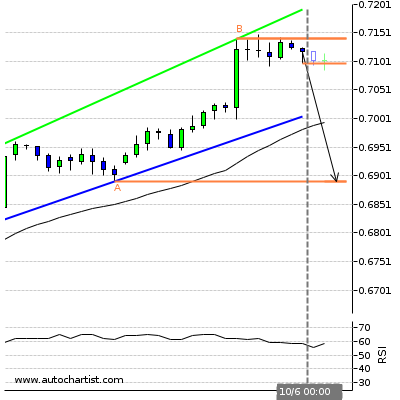 ( A ) 0.6891Last support turning point of Channel Up. Triangle identified at 10-Jun-05:00 2016 GMT. This pattern is still in the process of forming. 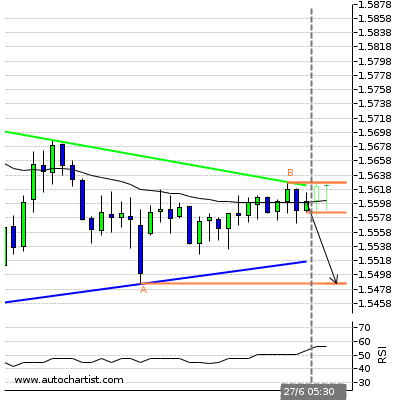 Possible bearish price movement towards the support 153.655 within the next 3 days. ( B ) 154.9615Last resistance turning point of Triangle. 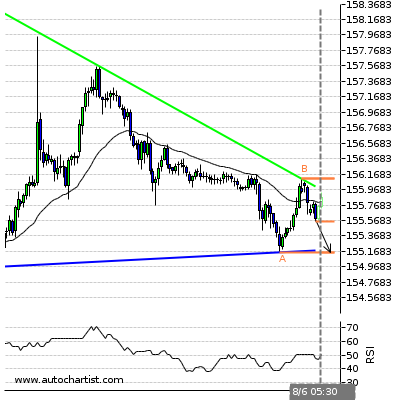 ( A ) 153.655Last support turning point of Triangle. Falling Wedge identified at 09-Jun-20:00 2016 GMT. This pattern is still in the process of forming. Possible bullish price movement towards the resistance 122.705 within the next 3 days. 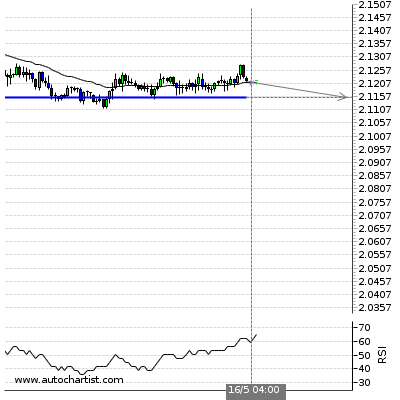 ( B ) 122.705Last resistance turning point of Falling Wedge. 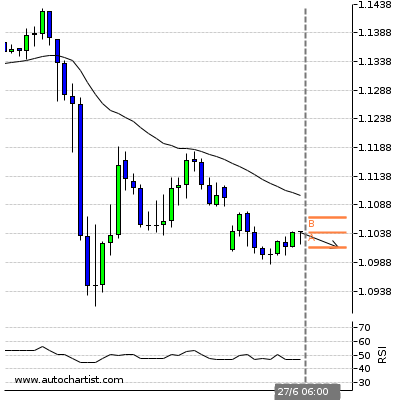 ( A ) 120.3195Last support turning point of Falling Wedge. Channel Down identified at 09-Jun-20:00 2016 GMT. This pattern is still in the process of forming. Possible bullish price movement towards the resistance 1.422 within the next 2 days. 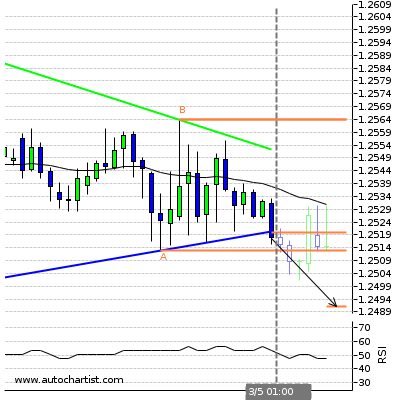 ( B ) 1.4222Last resistance turning point of Channel Down. 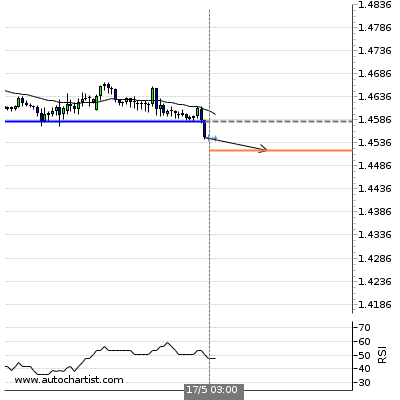 ( A ) 1.3862Last support turning point of Channel Down. Channel Down identified at 09-Jun-12:00 2016 GMT. This pattern is still in the process of forming. 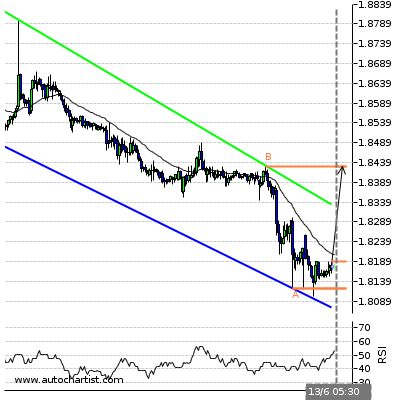 Possible bullish price movement towards the resistance 1.88 within the next 2 days. ( B ) 1.8798Last resistance turning point of Channel Down. 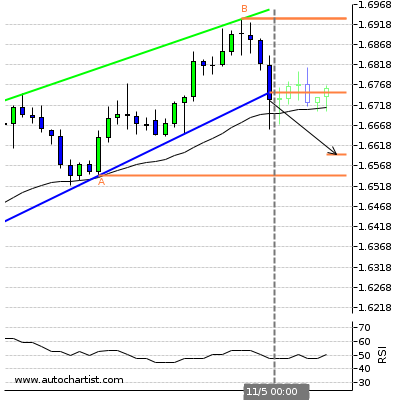 ( A ) 1.835Last support turning point of Channel Down. Triangle has broken through the resistance line at 10-Jun-03:00 2016 GMT. 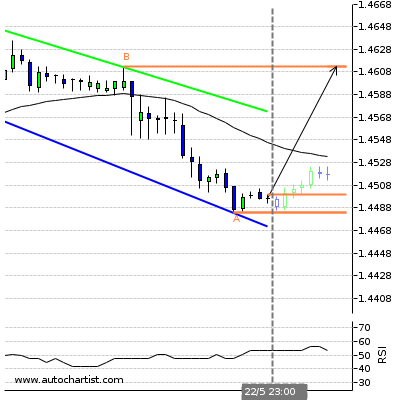 Possible bullish price movement forecast for the next 5 hours towards 1.596. ( B ) 1.5941Last resistance turning point of Triangle. ( A ) 1.5882Last support turning point of Triangle. Channel Down identified at 10-Jun-04:00 2016 GMT. This pattern is still in the process of forming. 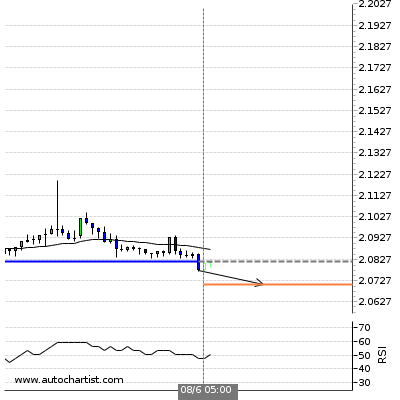 Possible bullish price movement towards the resistance 2.12 within the next 3 days. ( B ) 2.1196Last resistance turning point of Channel Down. 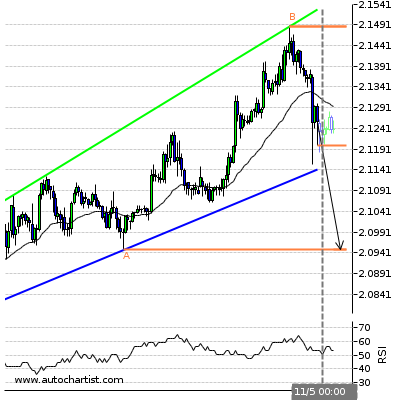 ( A ) 2.0276Last support turning point of Channel Down. Triangle identified at 09-Jun-20:00 2016 GMT. This pattern is still in the process of forming. Possible bullish price movement towards the resistance 84.586 within the next 3 days. ( B ) 84.5855Last resistance turning point of Triangle. ( A ) 83.4335Last support turning point of Triangle. Triangle identified at 10-Jun-00:00 2016 GMT. This pattern is still in the process of forming. 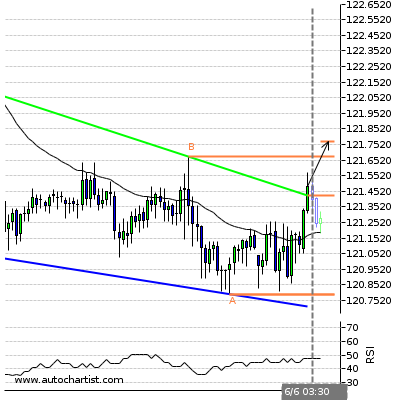 Possible bullish price movement towards the resistance 111.67 within the next 3 days. ( B ) 111.67Last resistance turning point of Triangle. ( A ) 110.235Last support turning point of Triangle. 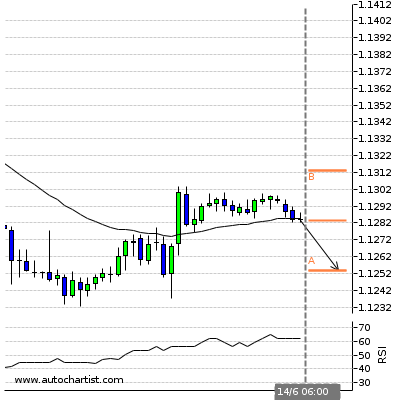 Possible bearish price movement towards the support 1.1224 within the next 4 hours. Descending Triangle has broken through the support line at 13-Jun-02:00 2016 GMT. Possible bearish price movement forecast for the next 3 days towards 104.5. ( A ) 107.185Last resistance turning point of Descending Triangle. 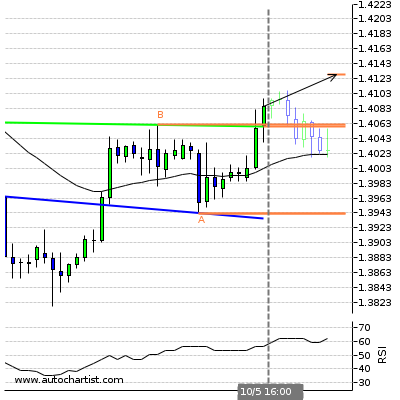 Possible bearish price movement towards the support 1.4153 within the next 4 hours. Possible bullish price movement towards the resistance 0.9674 within the next 4 hours. Channel Down identified at 13-Jun-03:30 2016 GMT. This pattern is still in the process of forming. 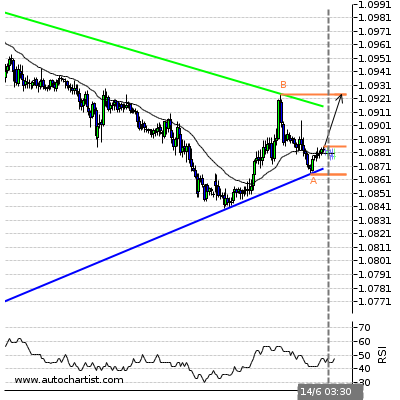 Possible bullish price movement towards the resistance 1.091 within the next 22 hours. 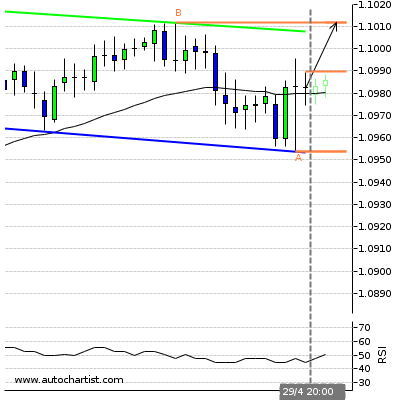 ( B ) 1.091Last resistance turning point of Channel Down. 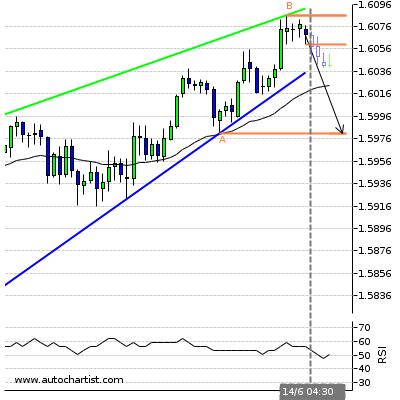 ( A ) 1.0845Last support turning point of Channel Down. Channel Down identified at 13-Jun-05:30 2016 GMT. This pattern is still in the process of forming. Possible bullish price movement towards the resistance 1.843 within the next 2 days. ( B ) 1.843Last resistance turning point of Channel Down. 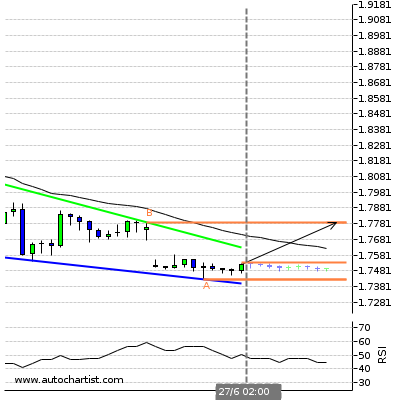 ( A ) 1.8122Last support turning point of Channel Down. Channel Down identified at 13-Jun-05:45 2016 GMT. This pattern is still in the process of forming. Possible bullish price movement towards the resistance 75.586 within the next 7 hours. ( B ) 75.5865Last resistance turning point of Channel Down. 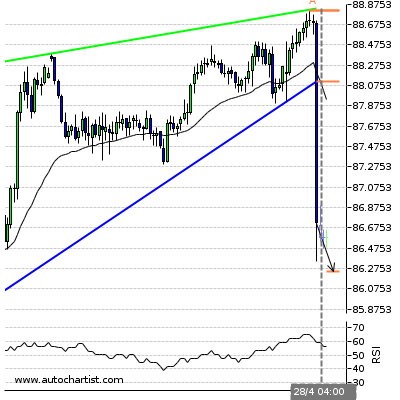 ( A ) 74.4695Last support turning point of Channel Down. 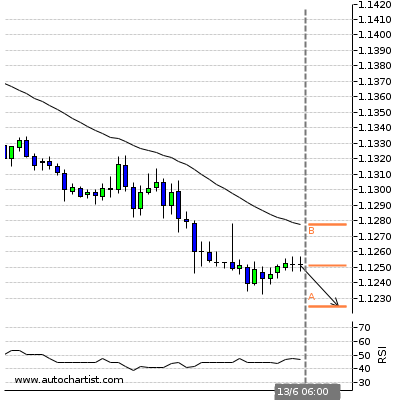 Possible bearish price movement towards the support 1.1254 within the next 4 hours. Descending Triangle has broken through the support line at 13-Jun-04:00 2016 GMT. 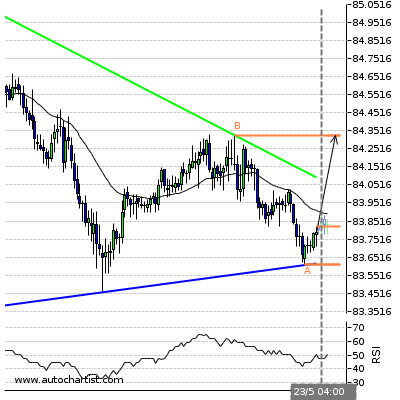 Possible bearish price movement forecast for the next 2 days towards 105.667. ( A ) 107.1925Last resistance turning point of Descending Triangle. 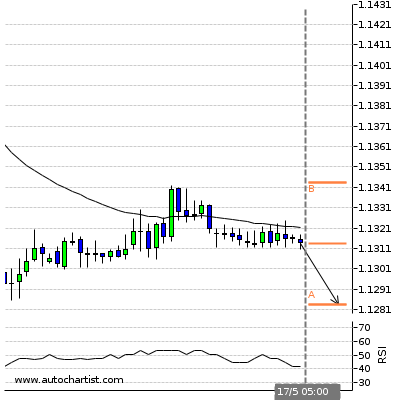 Possible bearish price movement towards the support 1.411 within the next 4 hours. Triangle identified at 14-Jun-02:00 2016 GMT. This pattern is still in the process of forming. Possible bullish price movement towards the resistance 0.741 within the next 18 hours. ( B ) 0.7411Last resistance turning point of Triangle. ( A ) 0.7374Last support turning point of Triangle. 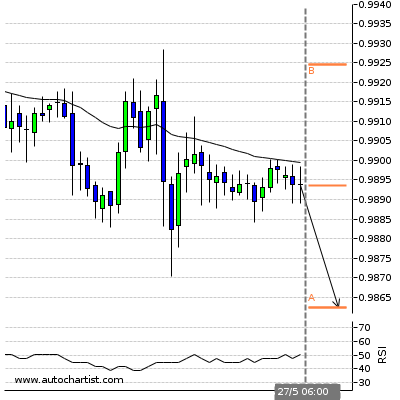 Possible bearish price movement towards the support 0.9609 within the next 4 hours. Rising Wedge identified at 14-Jun-01:30 2016 GMT. This pattern is still in the process of forming. 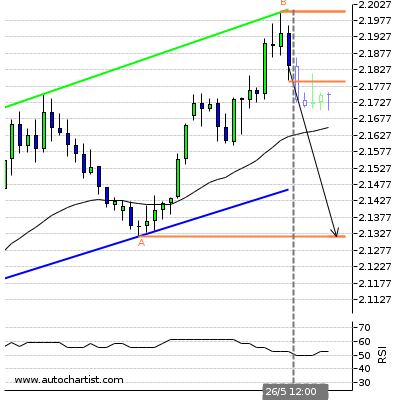 Possible bearish price movement towards the support 1.275 within the next 12 hours. ( B ) 1.2847Last resistance turning point of Rising Wedge. 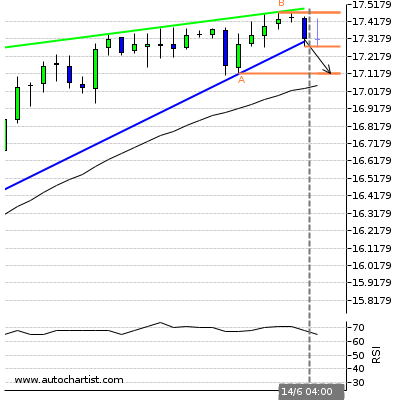 ( A ) 1.275Last support turning point of Rising Wedge. Triangle identified at 14-Jun-03:30 2016 GMT. This pattern is still in the process of forming. 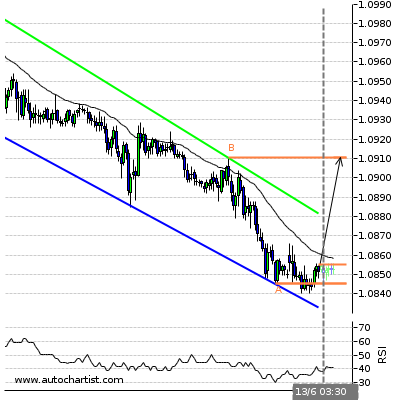 Possible bullish price movement towards the resistance 1.092 within the next 2 days. ( B ) 1.0924Last resistance turning point of Triangle. ( A ) 1.0865Last support turning point of Triangle. Channel Down identified at 13-Jun-16:00 2016 GMT. This pattern is still in the process of forming. Possible bullish price movement towards the resistance 1.88 within the next 3 days. 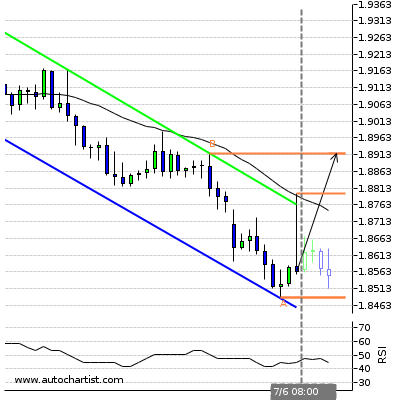 ( A ) 1.8033Last support turning point of Channel Down. Rising Wedge identified at 14-Jun-04:30 2016 GMT. This pattern is still in the process of forming. 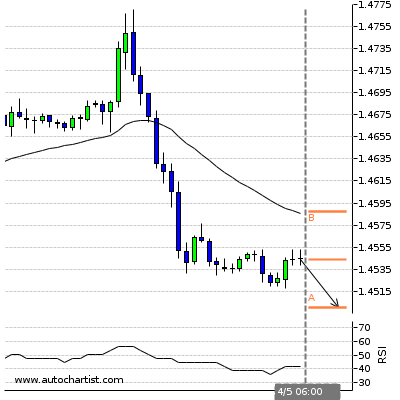 Possible bearish price movement towards the support 1.598 within the next 8 hours. ( B ) 1.6086Last resistance turning point of Rising Wedge. 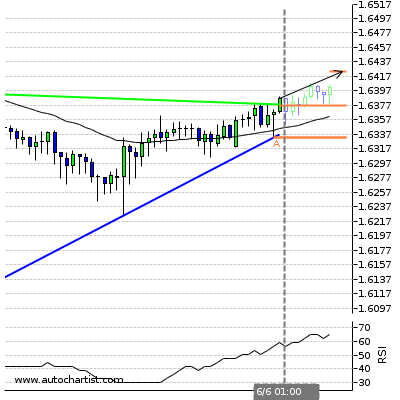 ( A ) 1.5981Last support turning point of Rising Wedge. Channel Up has broken through the support line at 14-Jun-04:00 2016 GMT. 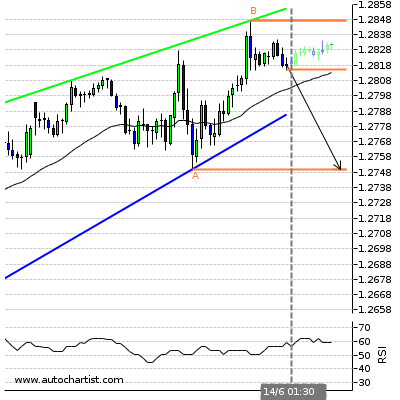 Possible bearish price movement forecast for the next 2 days towards 1,278.122. ( B ) 1287.23Last resistance turning point of Channel Up. ( A ) 1265.985Last support turning point of Channel Up. Rising Wedge identified at 14-Jun-04:00 2016 GMT. This pattern is still in the process of forming. Possible bearish price movement towards the support 17.12 within the next 2 days. ( B ) 17.47Last resistance turning point of Rising Wedge. ( A ) 17.12Last support turning point of Rising Wedge. Possible bullish price movement towards the resistance 1.1275 within the next 4 hours. Flag identified at 17-Jun-03:00 2016 GMT. This pattern is still in the process of forming. Possible bearish price movement towards the support 103.752 within the next 6 hours. ( B ) 104.836Last resistance turning point of Flag. ( A ) 103.7515Last support turning point of Flag. Possible bullish price movement towards the resistance 1.4298 within the next 4 hours. Triangle has broken through the support line at 17-Jun-02:30 2016 GMT. 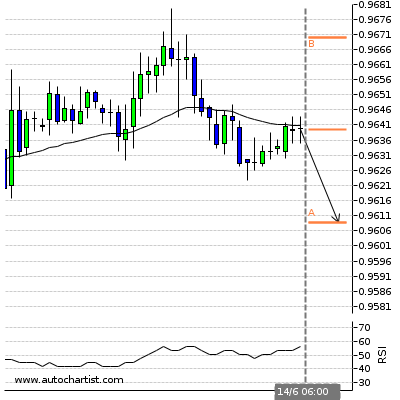 Possible bearish price movement forecast for the next 6 hours towards 0.961. ( B ) 0.9658Last resistance turning point of Triangle. ( A ) 0.9642Last support turning point of Triangle. Triangle identified at 17-Jun-00:00 2016 GMT. This pattern is still in the process of forming. 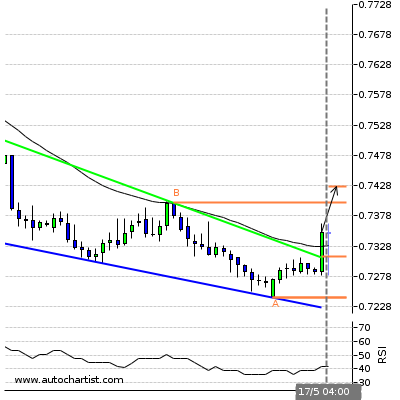 Possible bullish price movement towards the resistance 0.71 within the next 2 days. 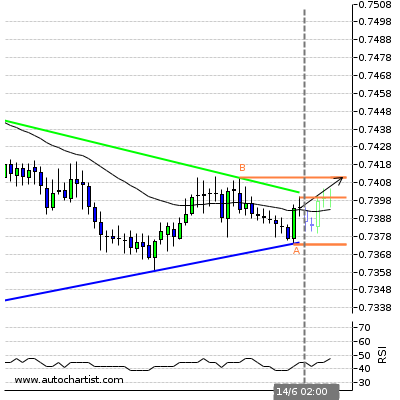 ( B ) 0.7097Last resistance turning point of Triangle. ( A ) 0.6968Last support turning point of Triangle. Channel Down has broken through the resistance line at 17-Jun-00:00 2016 GMT. 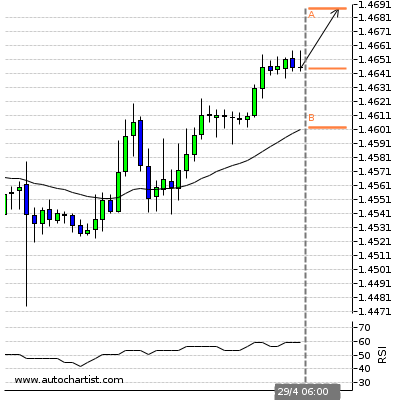 Possible bullish price movement forecast for the next 4 days towards 150.426. ( B ) 150.684Last resistance turning point of Channel Down. 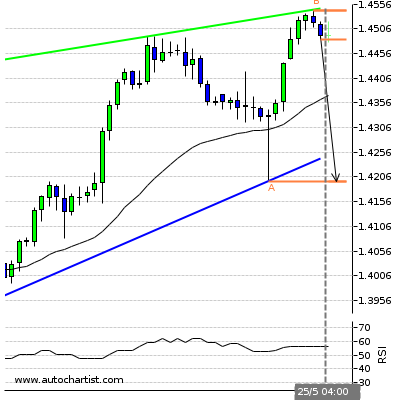 ( A ) 145.385Last support turning point of Channel Down. Triangle has broken through the resistance line at 15-Jun-16:00 2016 GMT. 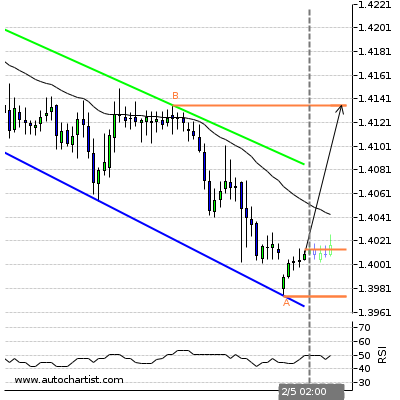 Possible bullish price movement forecast for the next 3 days towards 1.466. ( A ) 1.4367Last support turning point of Triangle. Channel Up identified at 17-Jun-03:00 2016 GMT. This pattern is still in the process of forming. 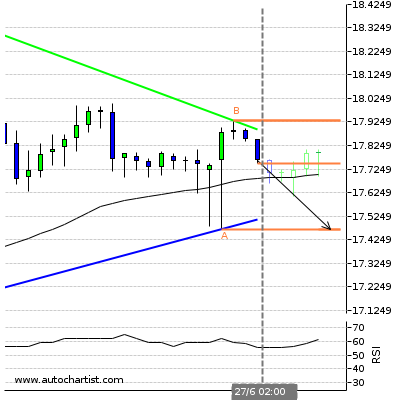 Possible bearish price movement towards the support 1.811 within the next 2 days. ( B ) 1.8469Last resistance turning point of Channel Up. 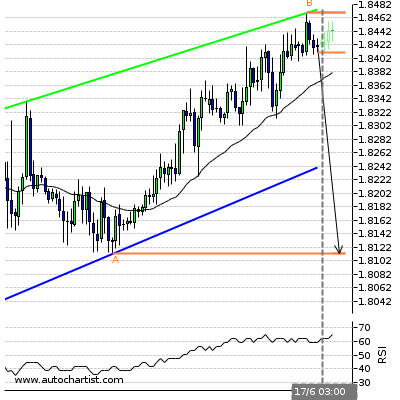 ( A ) 1.8112Last support turning point of Channel Up. Rising Wedge identified at 17-Jun-01:30 2016 GMT. This pattern is still in the process of forming. Possible bearish price movement towards the support 2.014 within the next 5 hours. ( B ) 2.0247Last resistance turning point of Rising Wedge. ( A ) 2.0139Last support turning point of Rising Wedge. 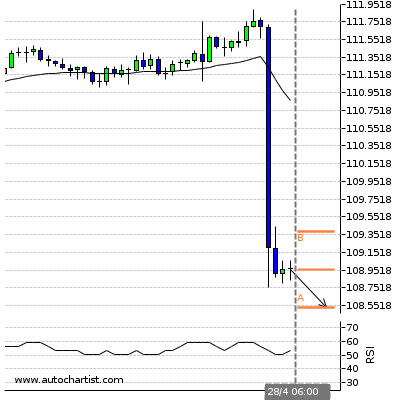 Possible bearish price movement towards the support 1.1013 within the next 4 hours. Possible bearish price movement towards the support 101.4159 within the next 4 hours. 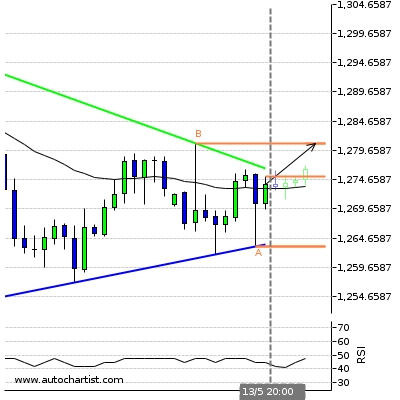 Possible bearish price movement towards the support 1.3353 within the next 4 hours. Possible bullish price movement towards the resistance 0.9774 within the next 4 hours. Triangle identified at 27-Jun-04:00 2016 GMT. This pattern is still in the process of forming. Possible bullish price movement towards the resistance 0.716 within the next 10 hours. 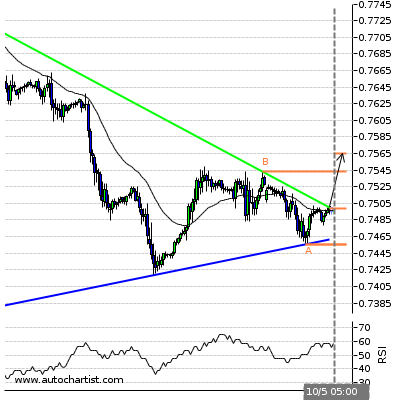 ( B ) 0.716Last resistance turning point of Triangle. ( A ) 0.7045Last support turning point of Triangle. Triangle identified at 27-Jun-04:00 2016 GMT. This pattern is still in the process of forming. Possible bullish price movement towards the resistance 1.446 within the next 6 hours. ( B ) 1.4459Last resistance turning point of Triangle. 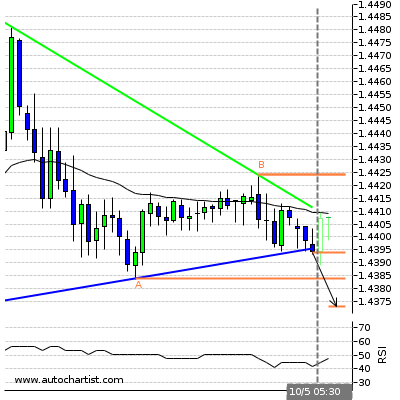 ( A ) 1.4341Last support turning point of Triangle. Falling Wedge identified at 27-Jun-02:00 2016 GMT. This pattern is still in the process of forming. 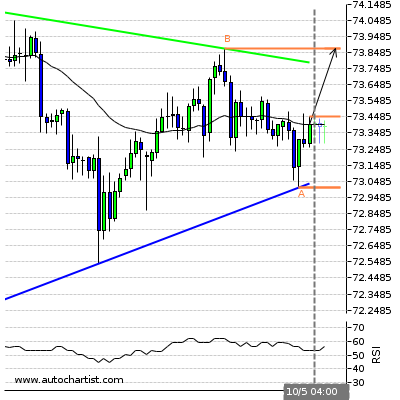 Possible bullish price movement towards the resistance 1.779 within the next 5 hours. 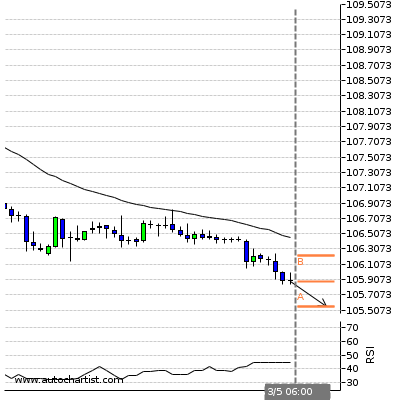 ( B ) 1.779Last resistance turning point of Falling Wedge. 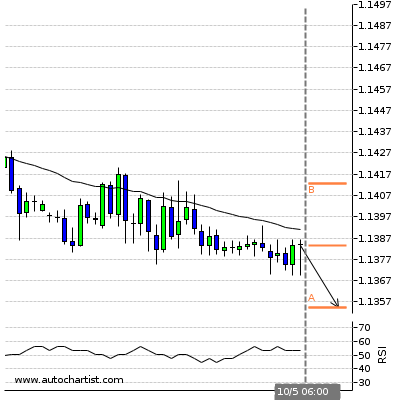 ( A ) 1.7423Last support turning point of Falling Wedge. Triangle identified at 27-Jun-05:30 2016 GMT. This pattern is still in the process of forming. 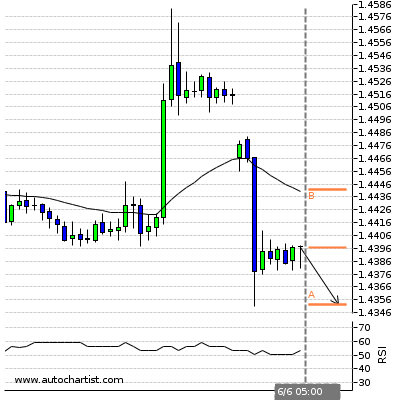 Possible bearish price movement towards the support 1.548 within the next 5 hours. ( B ) 1.5628Last resistance turning point of Triangle. 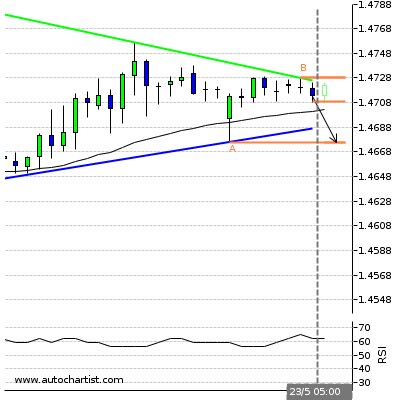 ( A ) 1.5485Last support turning point of Triangle. Descending Triangle identified at 27-Jun-05:30 2016 GMT. This pattern is still in the process of forming. 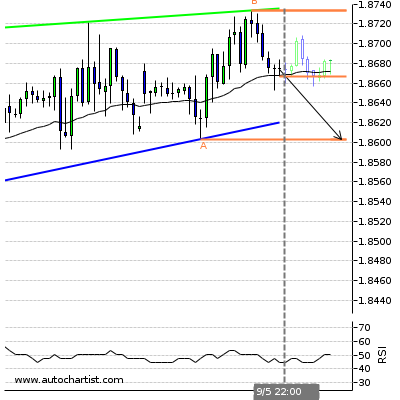 Possible bearish price movement towards the support 1.887 within the next 10 hours. ( B ) 1.8985Last resistance turning point of Descending Triangle. ( A ) 1.8872Last support turning point of Descending Triangle. Triangle identified at 27-Jun-04:30 2016 GMT. This pattern is still in the process of forming. Possible bullish price movement towards the resistance 0.754 within the next 10 hours. ( A ) 0.7447Last support turning point of Triangle. Triangle has broken through the resistance line at 26-Jun-23:00 2016 GMT. 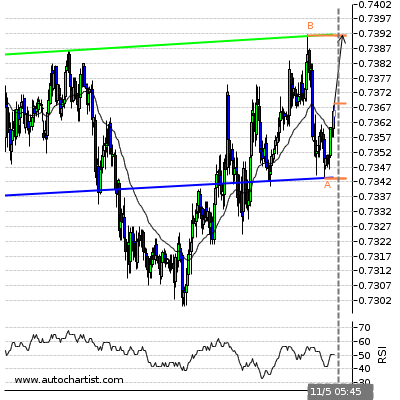 Possible bullish price movement forecast for the next 8 hours towards 107.762. 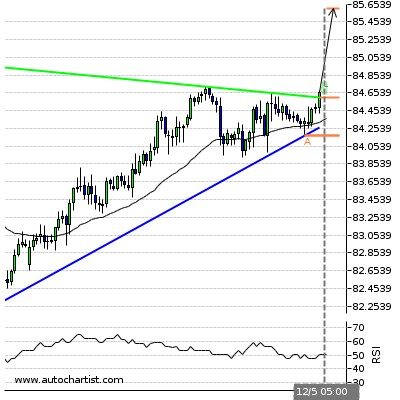 ( B ) 105.89Last resistance turning point of Triangle. ( A ) 103.98Last support turning point of Triangle. Channel Up identified at 27-Jun-01:30 2016 GMT. This pattern is still in the process of forming. 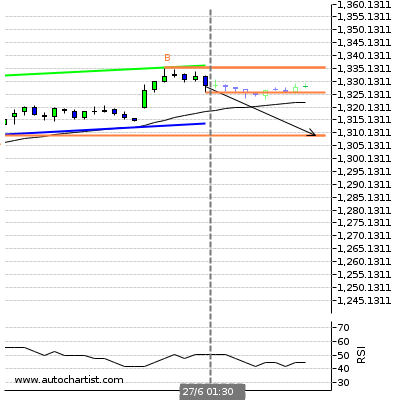 Possible bearish price movement towards the support 1,309.24 within the next 5 hours. ( B ) 1335.54Last resistance turning point of Channel Up. 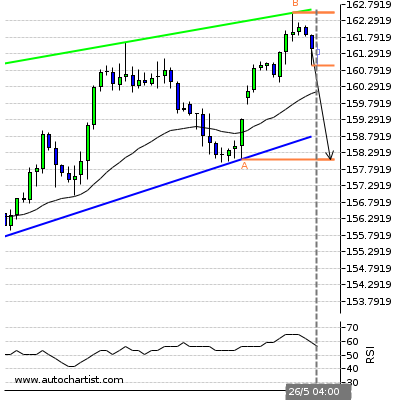 ( A ) 1309.24Last support turning point of Channel Up. Triangle identified at 27-Jun-02:00 2016 GMT. This pattern is still in the process of forming. Possible bearish price movement towards the support 17.47 within the next 8 hours. ( B ) 17.93Last resistance turning point of Triangle. 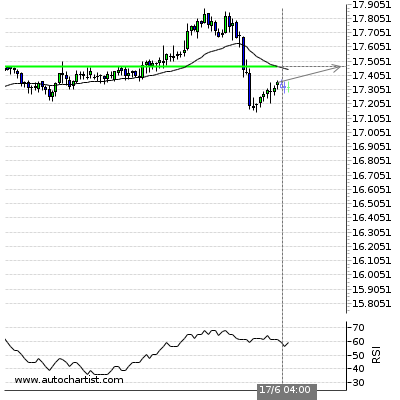 ( A ) 17.47Last support turning point of Triangle.